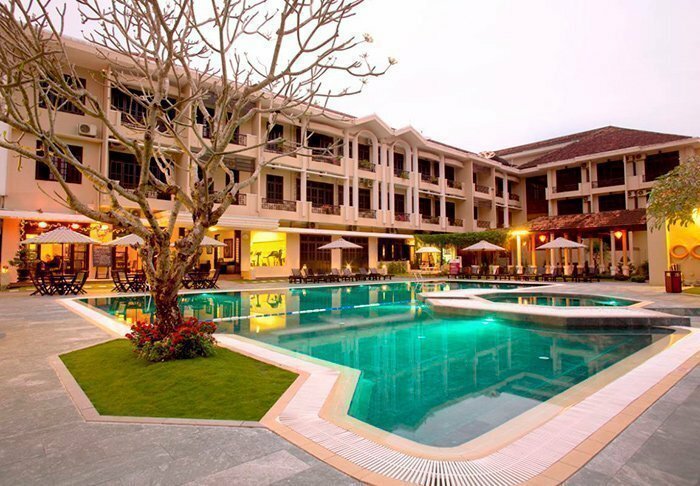 Here, you can find out more about the hotels that we use during our tours to Vietnam. 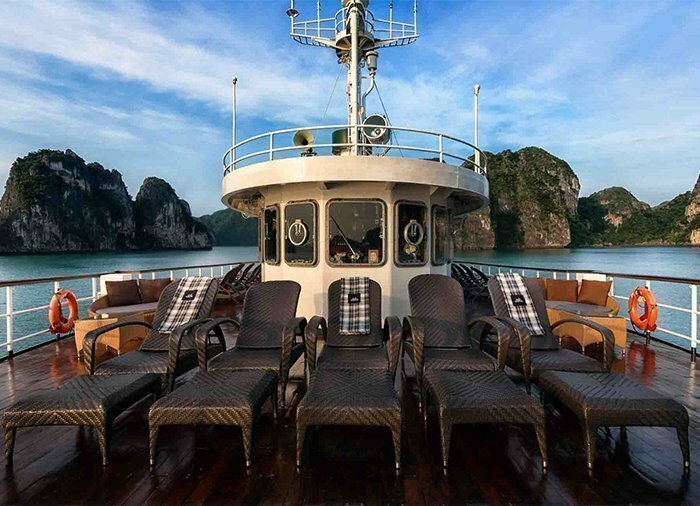 Aphrodite Cruises operates two magnificent wooden junks that sail 2 day/1 night mini-cruises around Ha Long Bay. 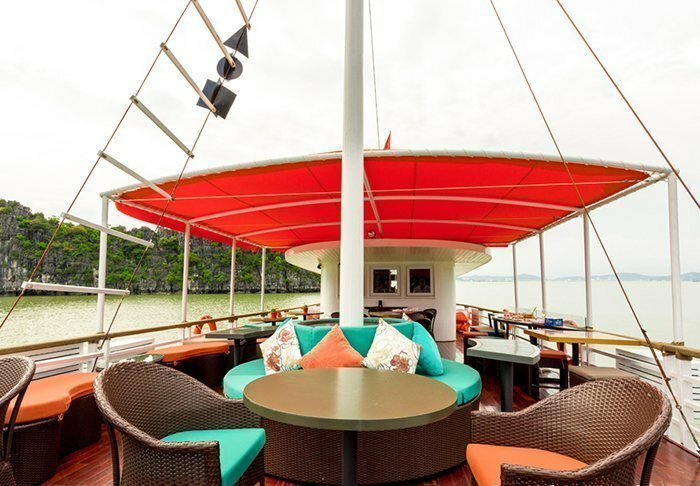 Each junk has four decks, two comprising a total of 17 cabins, and two featuring shared facilities such as a restaurant, bar and sun deck. 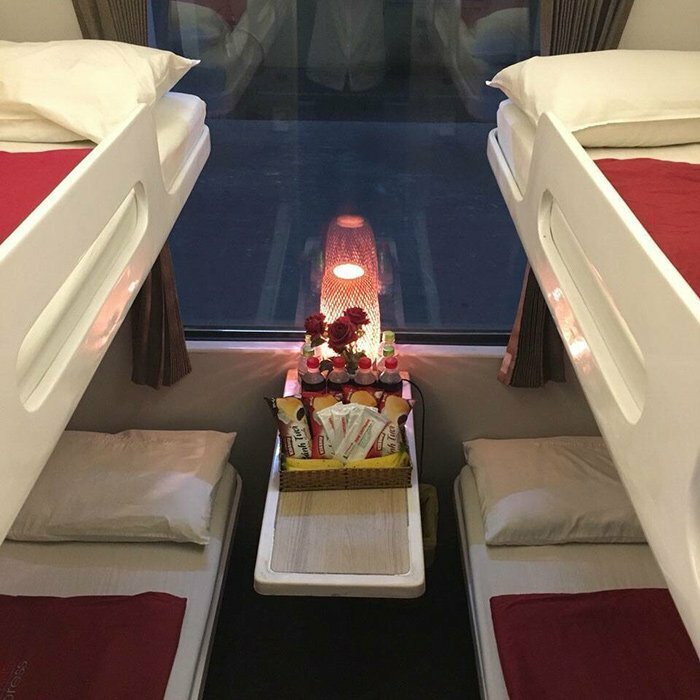 The cabins cover a minimum of 17 m² and are appointed with comfortable beds, air-conditioning and a practical bathroom including a bath tub and hair dryer. 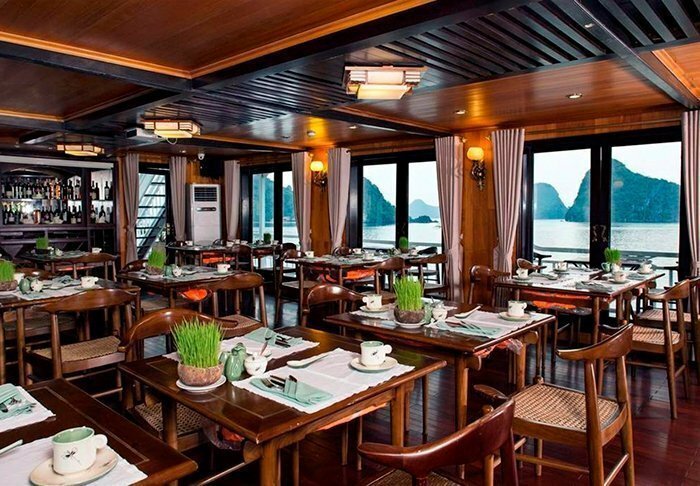 The restaurant seats 40 people and features broad viewing windows. 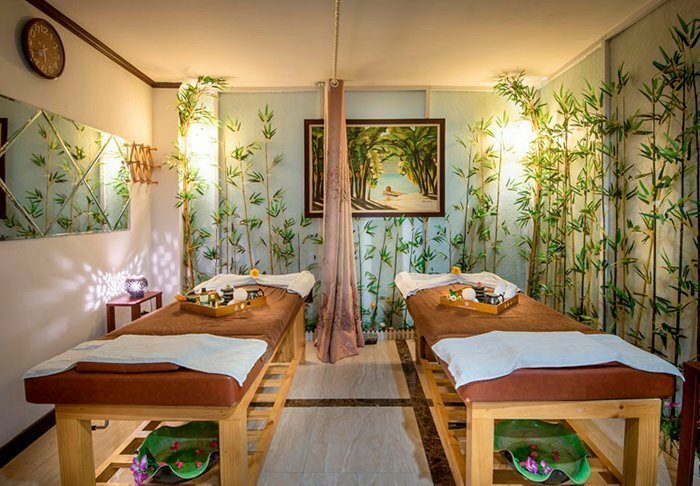 The junks also have a small spa section where you can book a relaxing massage. 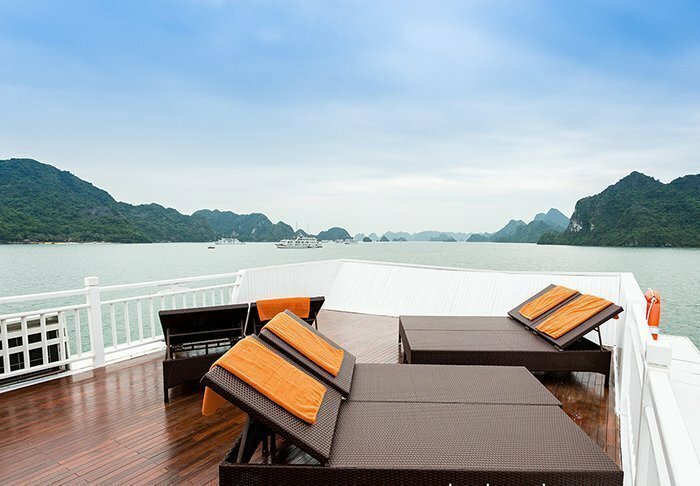 On board the Emeraude, you are sure to enjoy more than ‘just’ an unforgettable trip around the delightful Ha Long Bay. 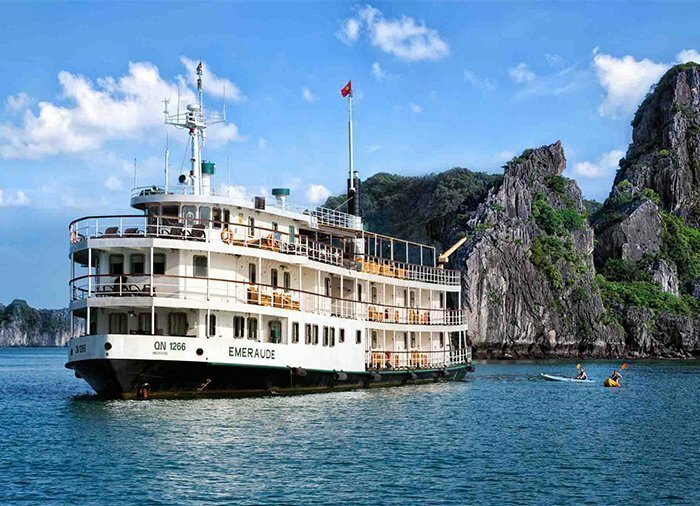 The voyage is actually a journey back in time to the period when this area was a part of French Indochina, because the modern Emeraude is a true copy of the original paddle steamer that sailed the waters of Ha Long Bay in the period 1910–1937. 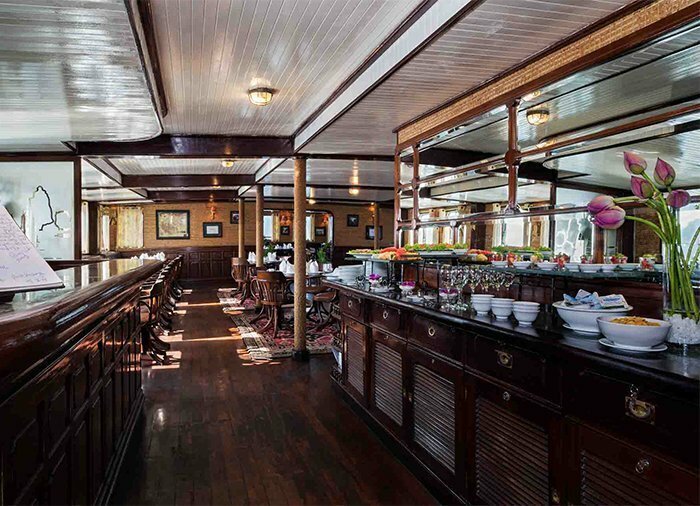 In 1999, Mr. Eric Merlin saw a postcard of the beautiful old steamer, and his passion for history and boats spurred him to bring the magnificent Emeraude back to life. 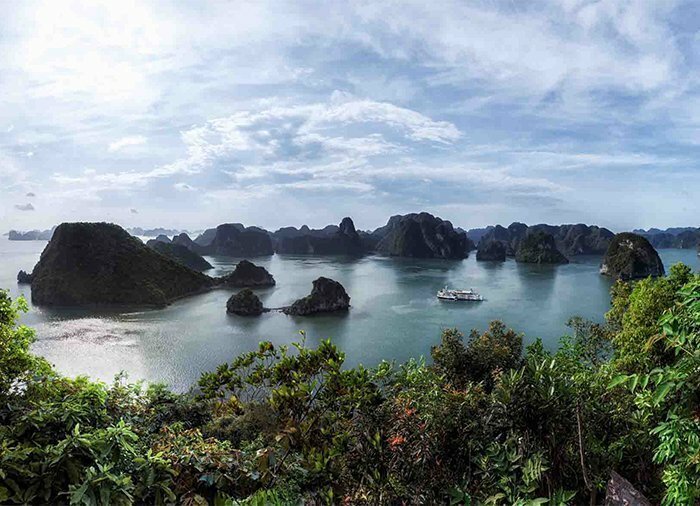 The new version of the vessel was completed in 2003, and you can look forward to experiencing the breath of history during your 2 day/1 night mini-cruise around Ha Long Bay. 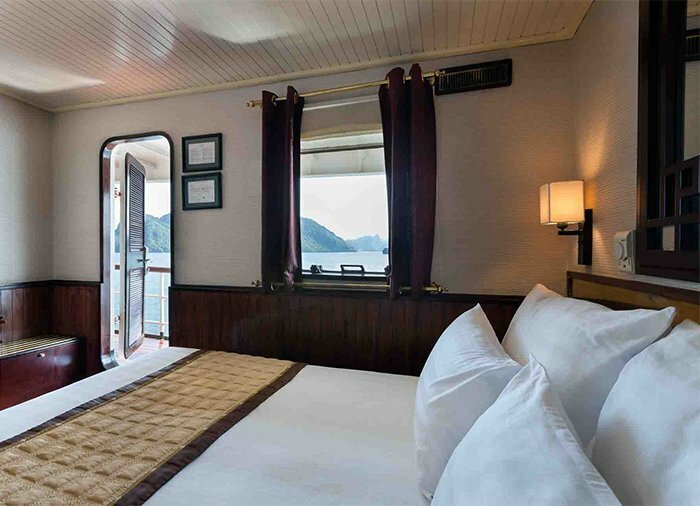 Emeraude has 37 cabins divided between three decks. 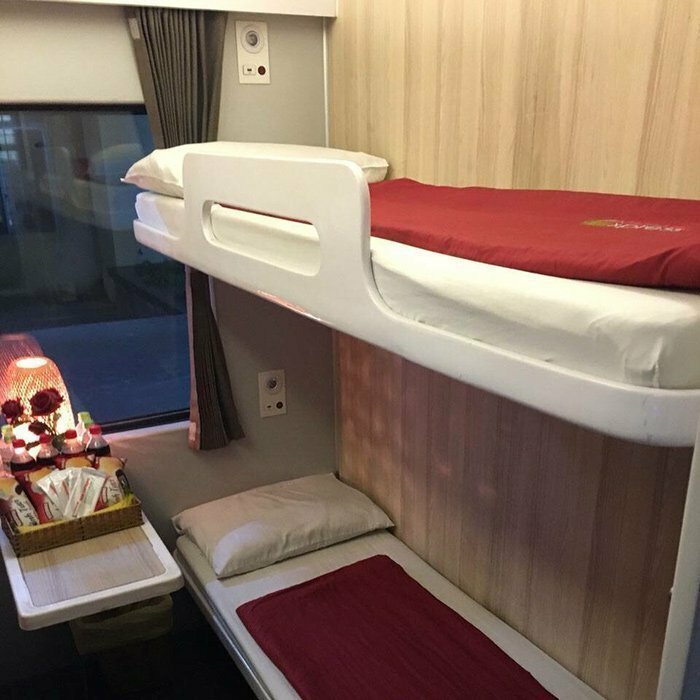 Each cabin comprises at least 14 m2 and has a separate bathroom and air conditioning. Shared facilities on board include a large restaurant, a shop, an outdoor cinema, two bars and two sun decks, where you can relax and admire the surroundings. 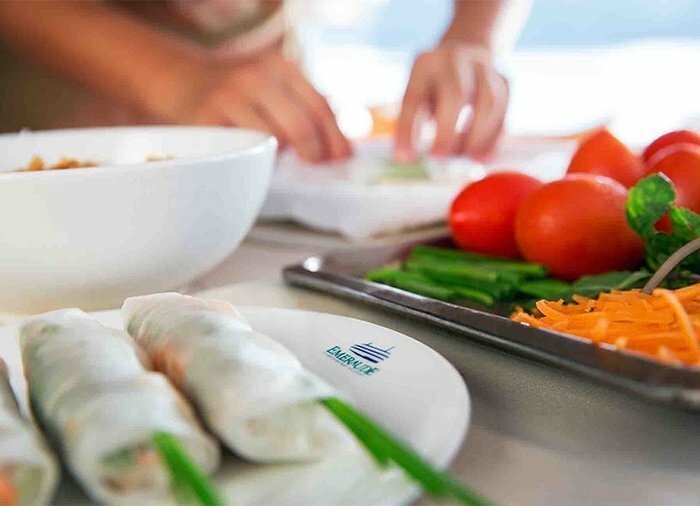 You can also borrow kayaks free of charge, take Tai Chi lessons, go fishing for squid, and take part in cooking courses to find out more about delicious Vietnamese cuisine. The friendly crew are ready and waiting to take you on a truly unforgettable journey. 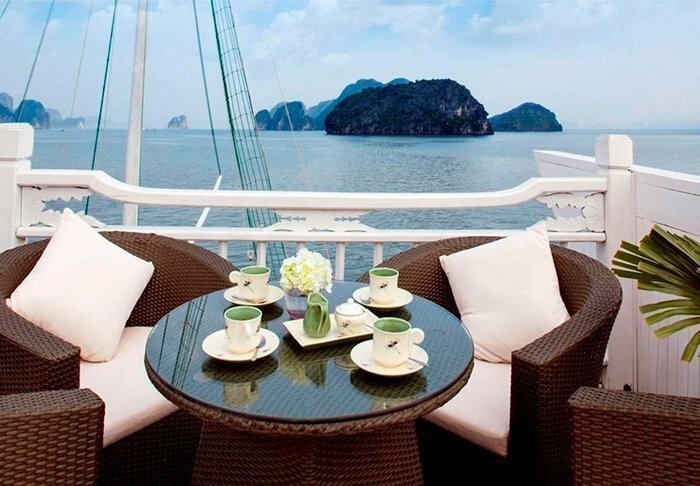 (Drinks on the boat are not included in the price). Please note: Emeraude cruise ship will be docked during August 2019. 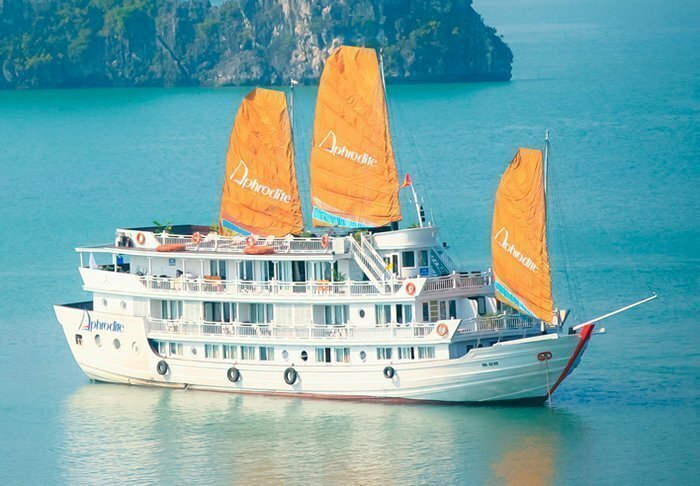 During this period L’Azalée cruise ship is used as a suitable alternative. 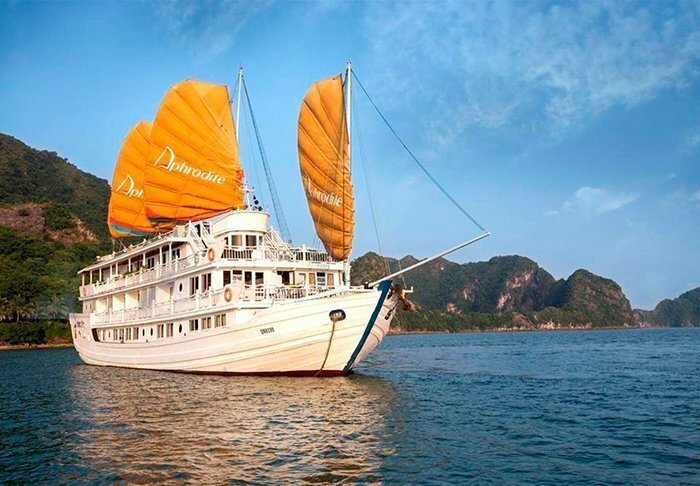 L’Azalée is a delightful wooden ship built in the style of a traditional Vietnamese junk. The ship is named after the azalea flower, which is a symbol of elegance, refinement and passion. 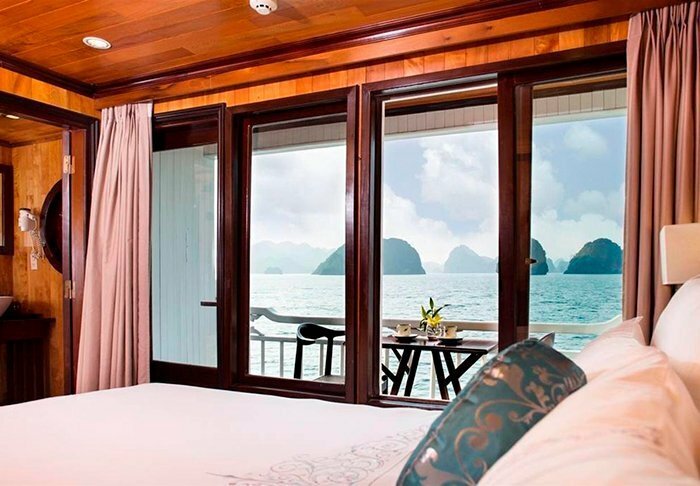 There are only 12 cabins plus a large, wonderful sun deck. 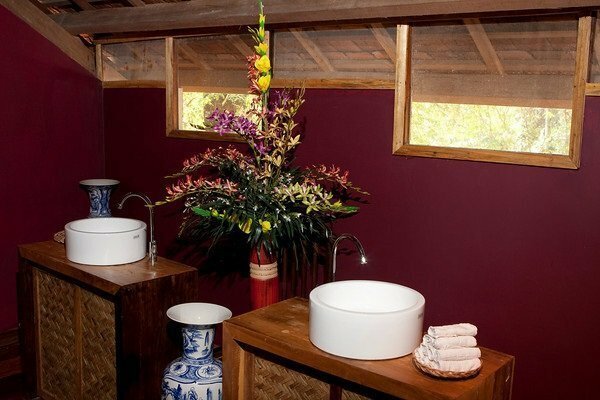 The cabins all have air conditioning and a separate shower room with hair-dryer and bath robes. 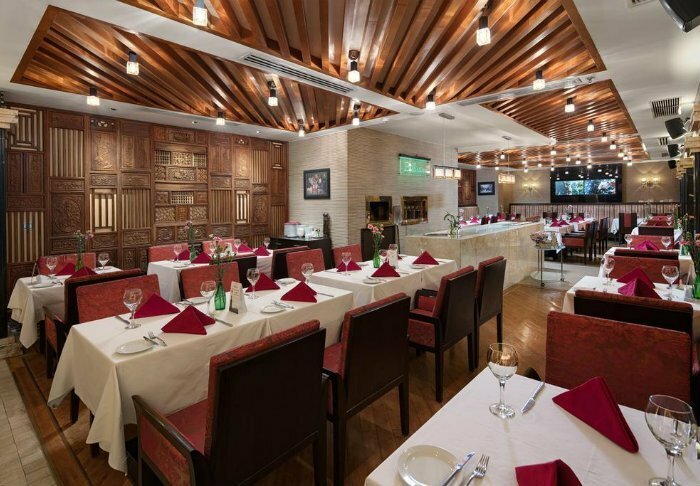 The restaurant is fully equipped, and there is also a bar and a library. In addition, the ship has a number of kayaks for guests to use. 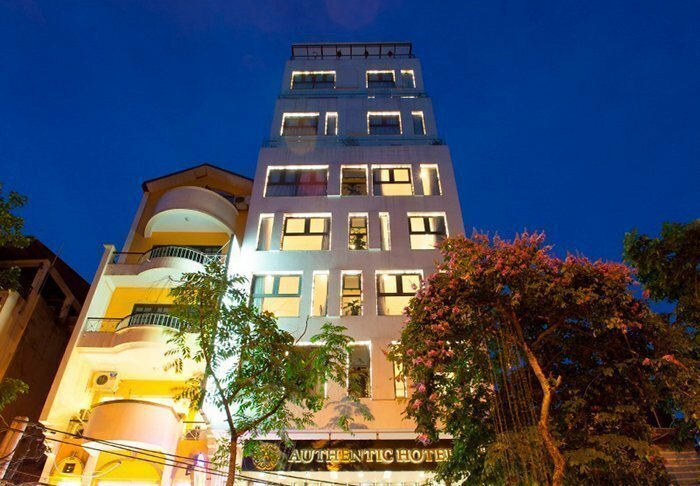 The Authentic Hanoi Hotel is located on the outskirts of the old part of the city – Hoan Kiem – close to Hoan Kiem Lake. 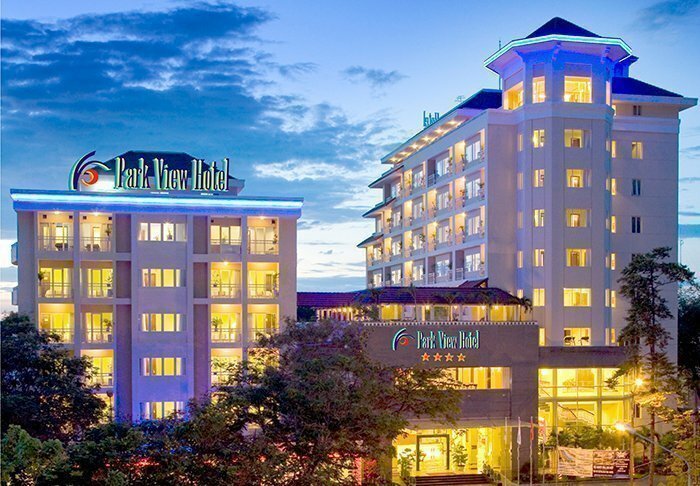 The city centre is within easy walking distance of the hotel, and the airport is only 40 minutes away by car. 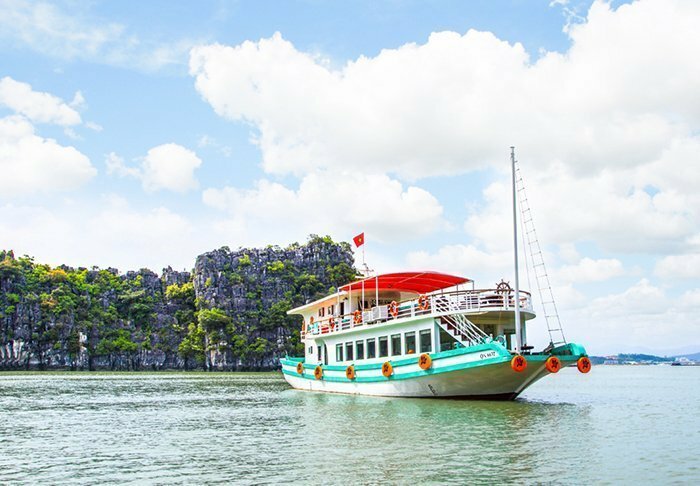 Nearby attractions include the Thang Long Water Puppet Theatre and the Ngoc Son and Ba Kieu temples. 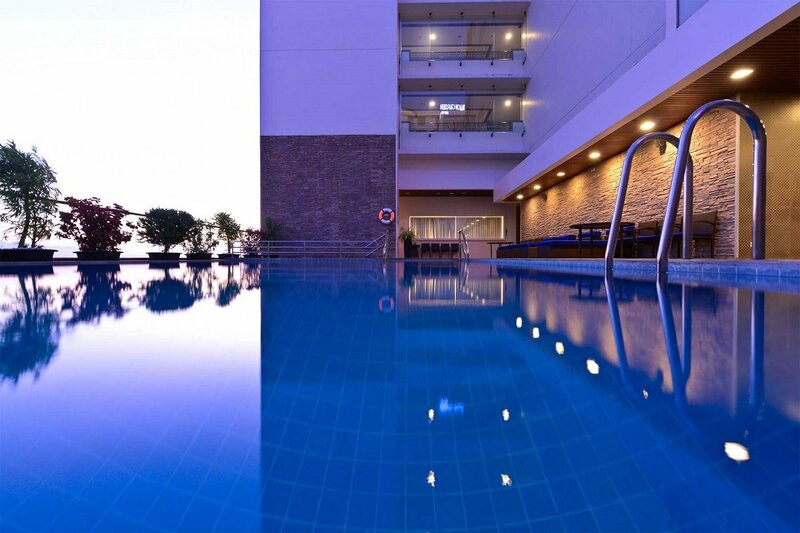 The hotel is housed in a modern building, and facilities include a fitness centre and two restaurants. 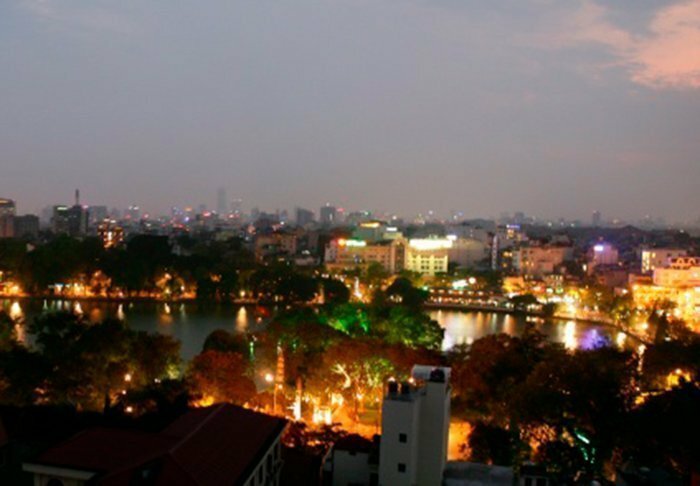 One of the restaurants is on the top floor of the hotel, from where there is a magnificent view out over Hoan Kiem Lake. 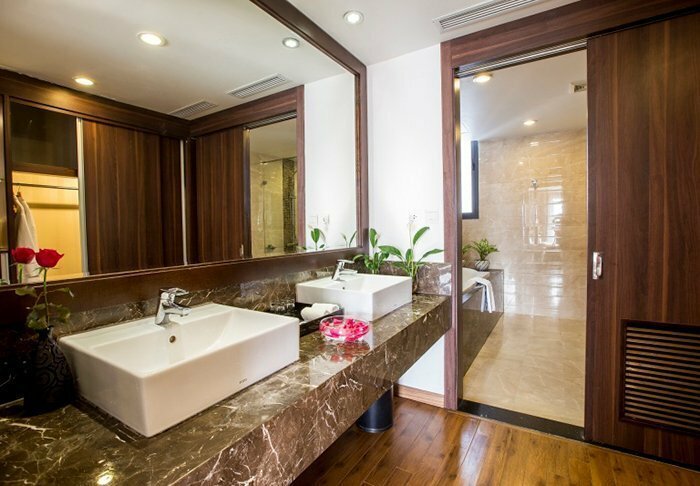 The modern rooms are simply furnished and all have their own bathroom with a hair-dryer. In-room conveniences include satellite/cable TV, a fridge and free bottled water. 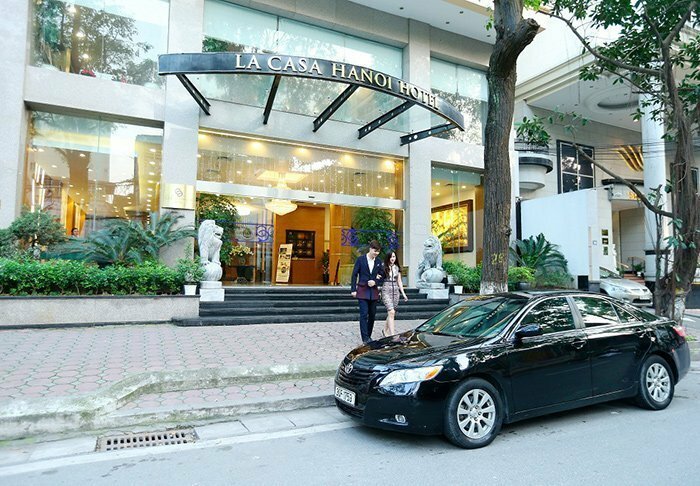 Situated around a 10-minute walk from Hanoi city centre, the French Quarter and the popular Hoan Kiem Lake is the modern and recently refurbished La Casa Hanoi Hotel. 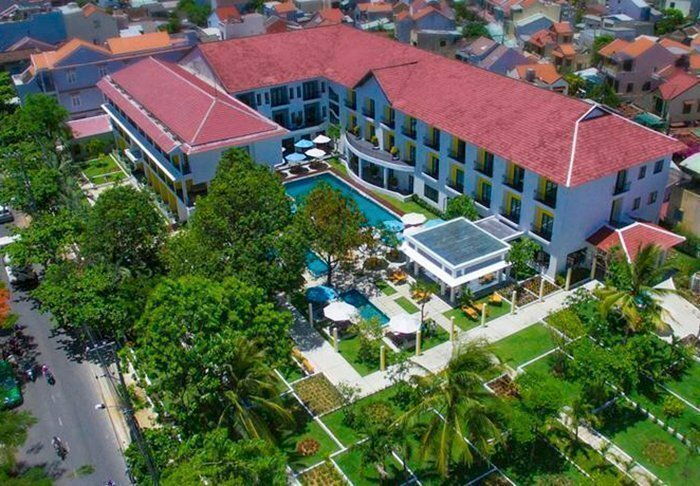 The hotel’s 88 rooms are decorated in a combination of Vietnamese and French style with a large desk, a TV, air conditioning, a minibar, free Wi-Fi, a safe and tea/coffee making facilities. 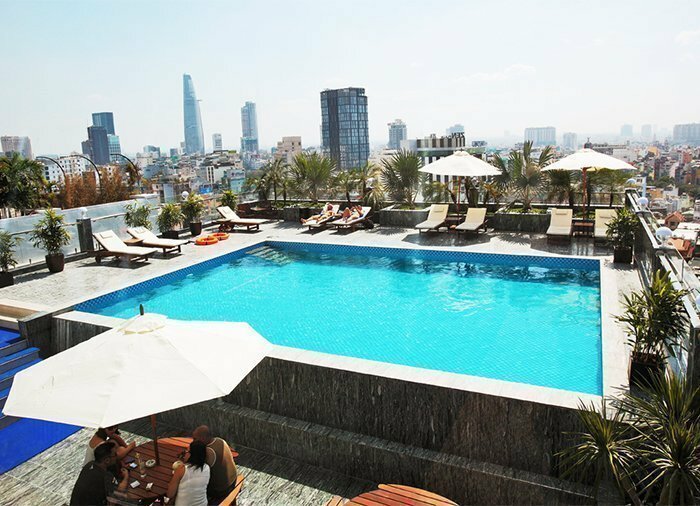 From the hotel’s rooftop terrace and bar is an enchanting 360° view over the city. 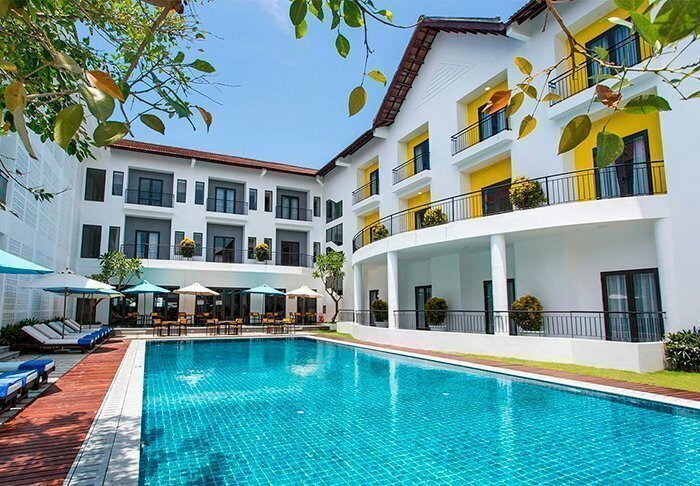 There is also an outdoor swimming pool, gym and spa as well as two restaurants serving both international and Vietnamese dishes. 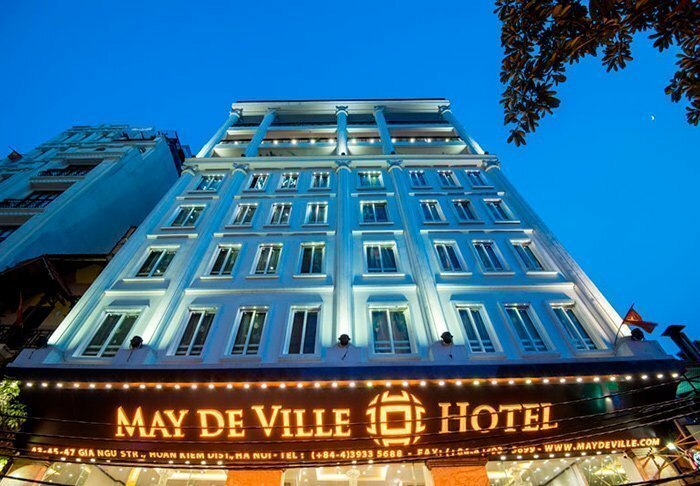 In the heart of Hanoi Old Quarter is the welcoming May de Ville Old Quarter Hotel. 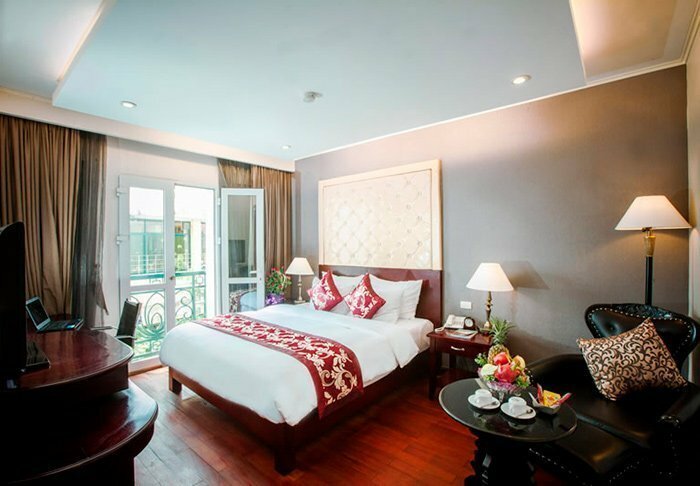 where you are just a stone’s throw from Hoan Kiem Lake and walking distance from many of the city’s other attractions. 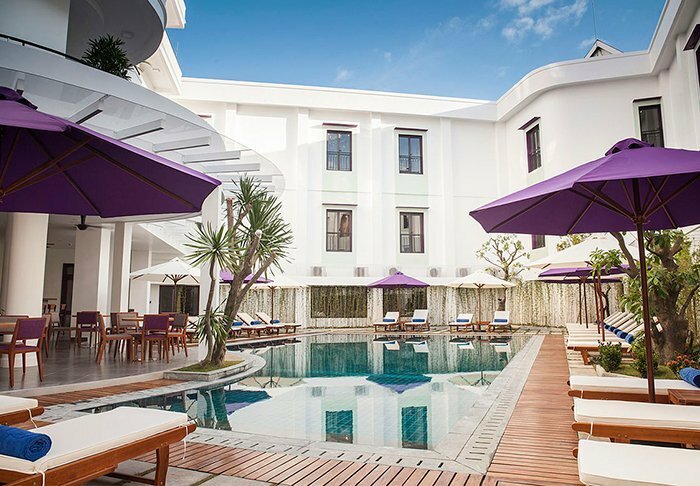 The hotel’s 110 rooms are spacious with modern Vietnamese décor (at least 25 m²). 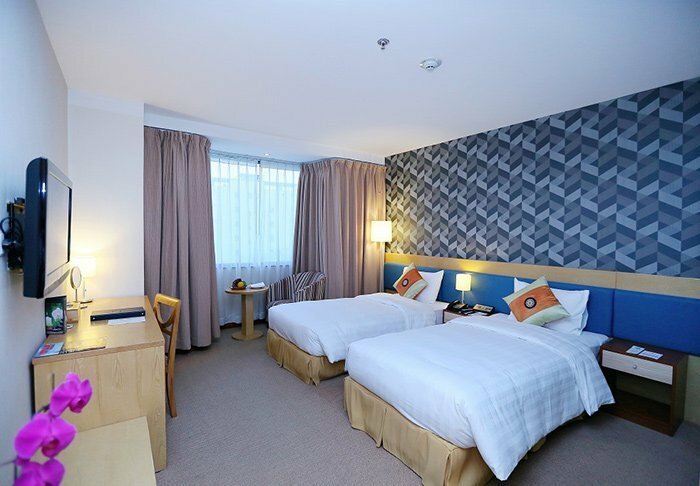 All rooms offer free Wi-Fi, a TV, a safe, air conditioning, a wardrobe, a small seating area and a desk. 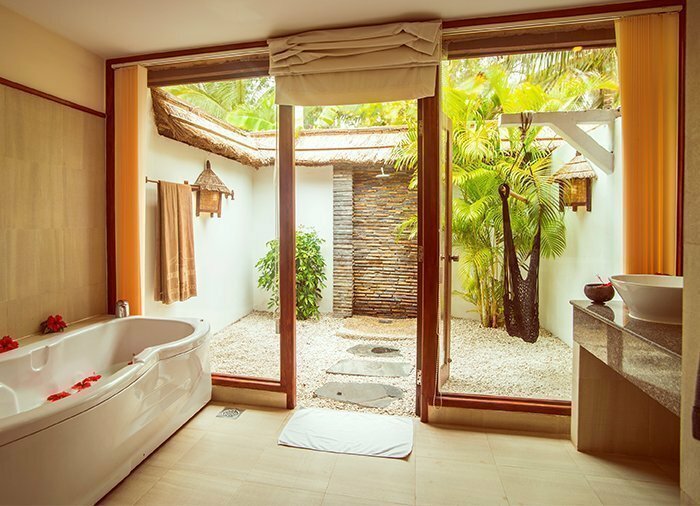 The bathroom also includes a hair dryer, bathrobe and slippers. 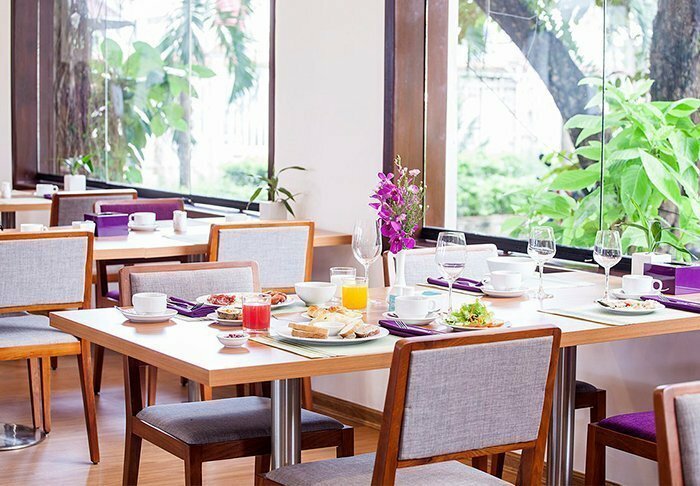 The restaurant serves a delicious breakfast buffet with a wide selection of Vietnamese and Western dishes. 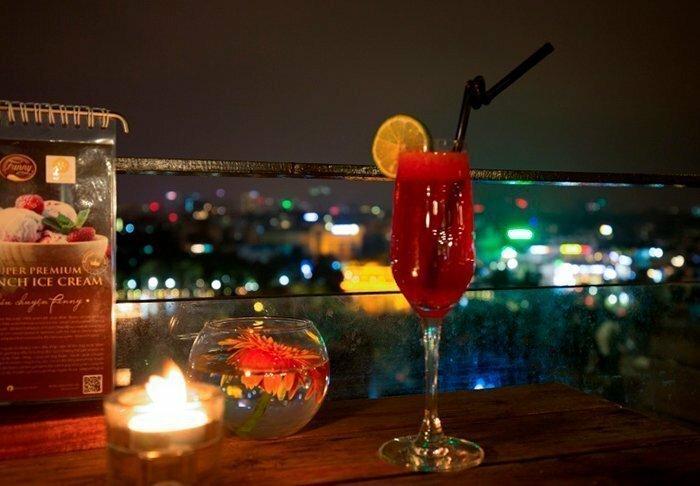 There is also a cosy bar on the rooftop terrace where you can enjoy a refreshing cocktail and the outstanding panoramic view. You can also enjoy a spot of pampering in the hotel spa or sauna, enjoy the pool at the top of the hotel or use the gym. 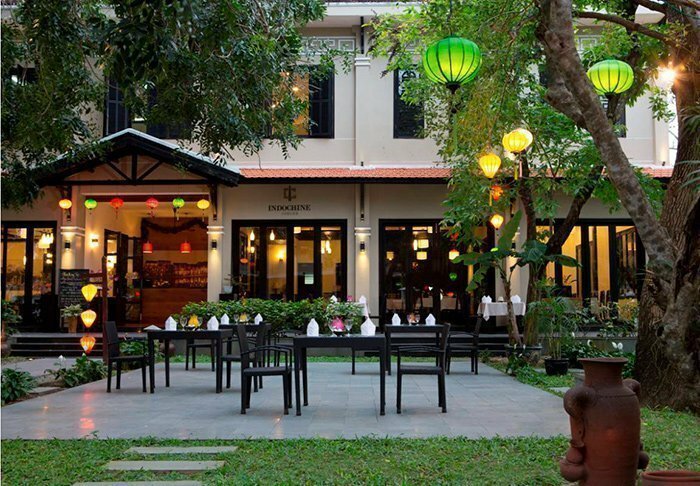 Situated in the heart of Hanoi Old Quarter is the cosy Medallion Hanoi Boutique Hotel, close to Hanoi’s sights such as the popular Hoan Kiem Lake and the famous puppet theatre. 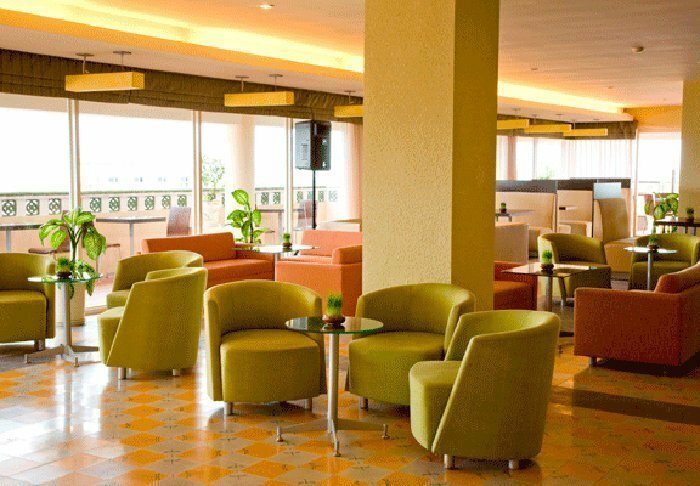 The hotel has 70 rooms equipped with air conditioning, a safe, a minibar, satellite flat-screen TV and tea and coffee making facilities. 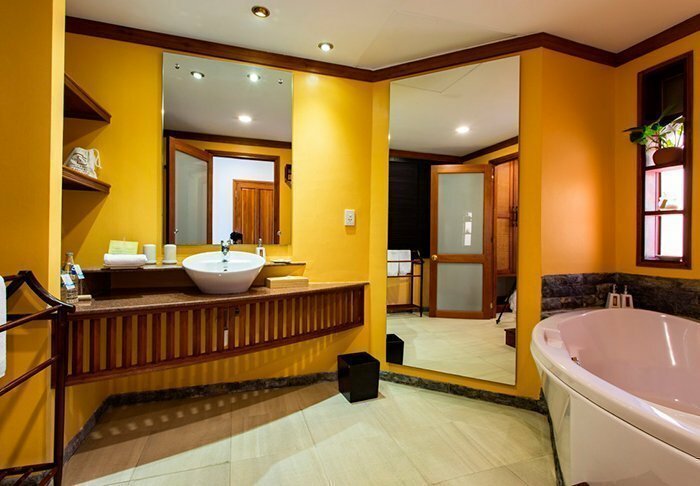 All rooms are spacious (at least 25 m²) and have an en suite bathroom with bathrobes, slippers and a hair dryer. 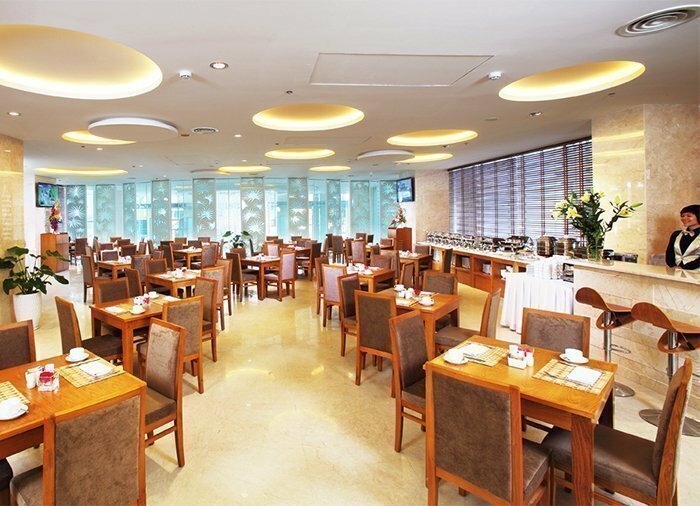 The restaurant serves a delicious breakfast buffet consisting of both Western and Asian dishes. 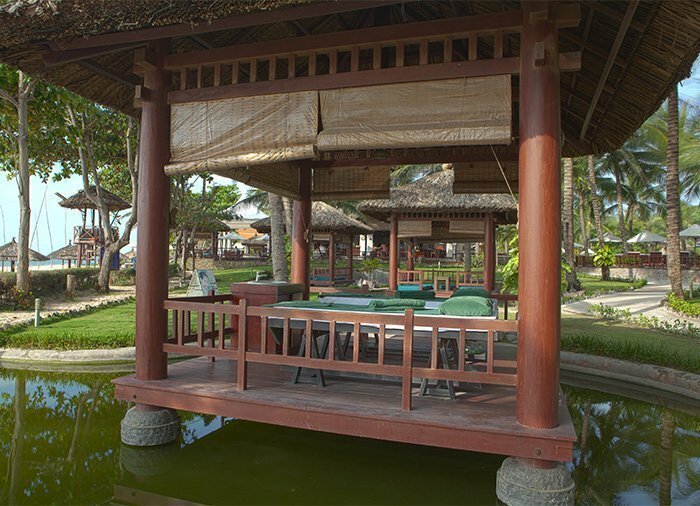 The hotel also has a small idyllic bar, gym and souvenir shop selling locally produced goods such as silk and lacquerware. There is free Wi-Fi throughout the hotel. 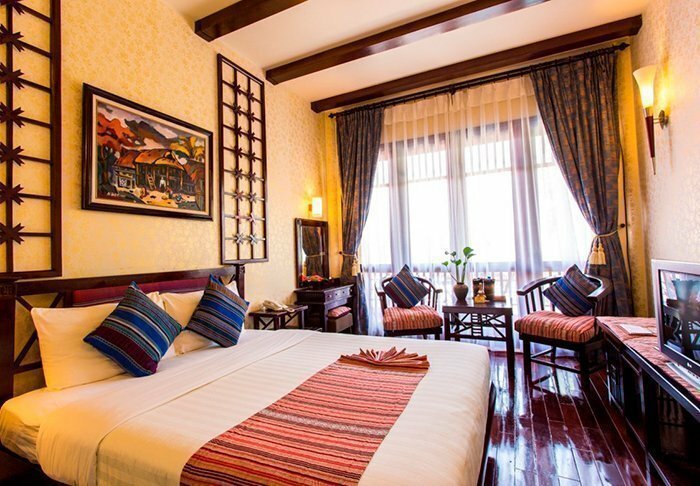 Silk Path Hanoi Hotel is situated at the heart of Hanoi’s old district and is in walking distance from many of the town’s sightseeing spots, including the Hoan Kiem Lake, the Ngoc Son temple, Hanoi’s catholic church, and various markets. 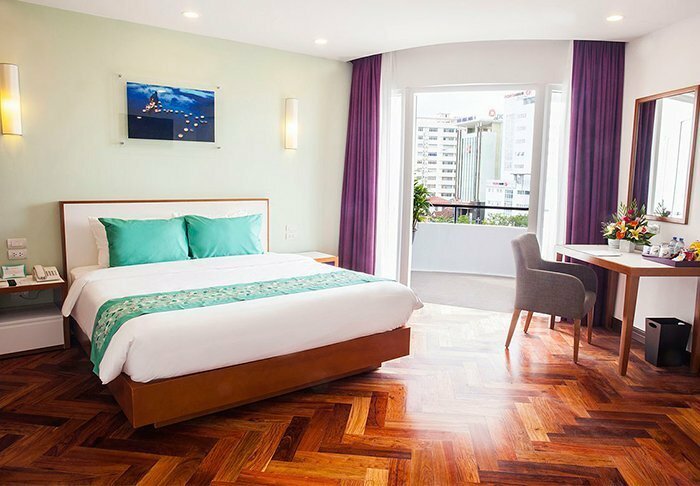 The hotel features 106 beautiful, spacious rooms with Wi-Fi, air conditioning, a mini-bar, TV, safe, coffee and tea facilities as well as a bathroom with a shower and bath tub. 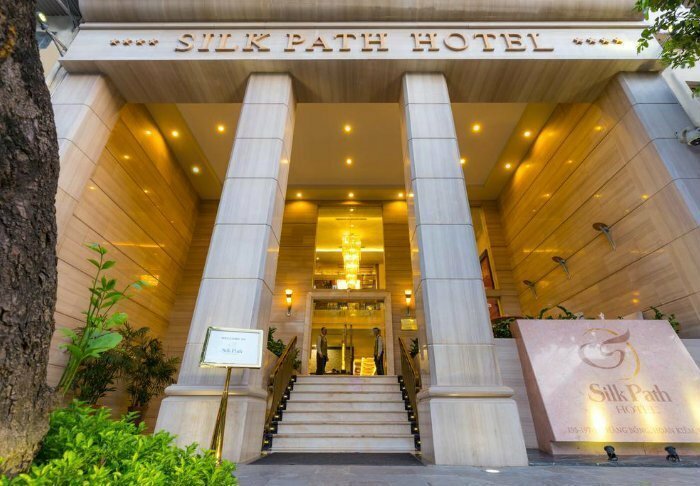 Silk Path has two restaurants. 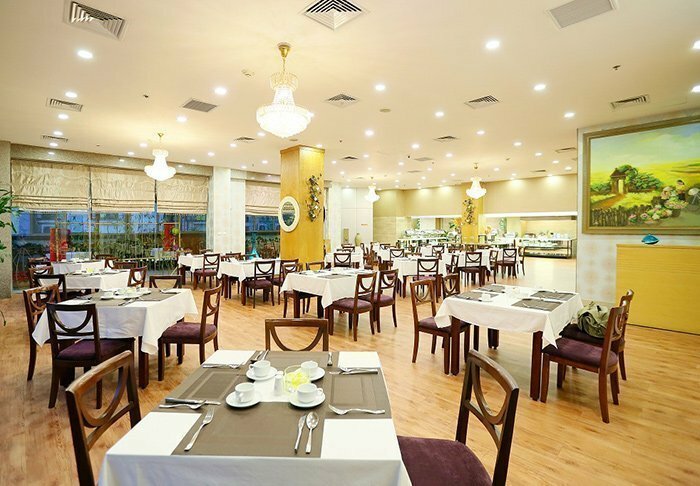 A traditional and international breakfast buffet is served at La Soie de Hanoi and Mediterranean dishes can be found at Bellissimo. The bar Silk Bar & Piano offers beer and drinks. There is a fitness room on the top floor of the hotel. 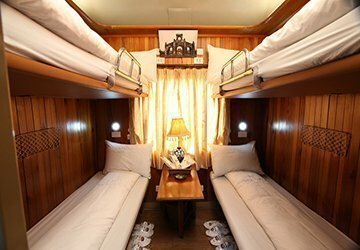 Overnight accommodation in a 4-bunk sleeper carriage on the night train, Livitrans, from Hanoi to Danang. 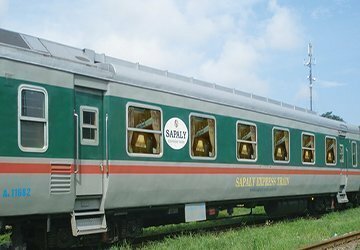 A private compartment can be arranged for a supplementary fee, as you will have to pay for the unused bunks. 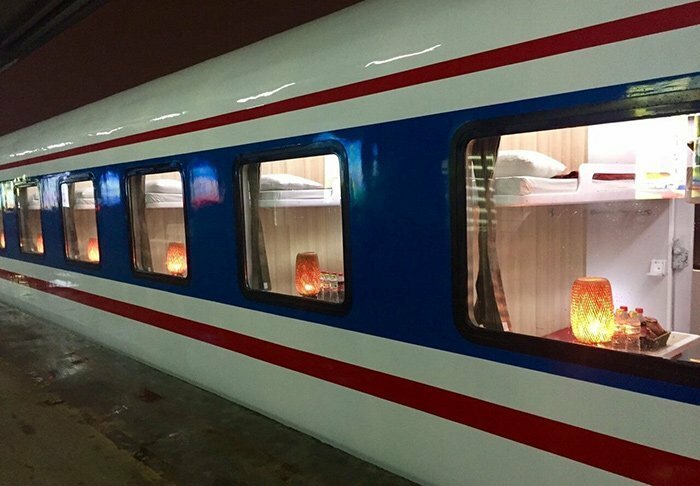 Overnight accommodation in a 4-bunk sleeper carriage on the night train, from Hanoi to Lao Cai and back to Hanoi. 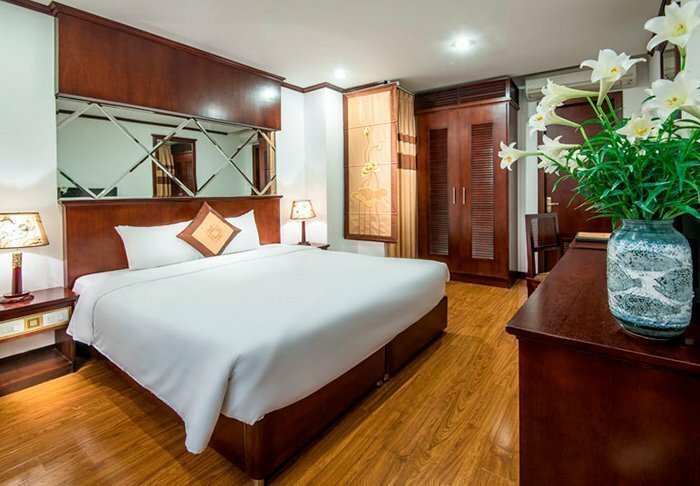 The 4-star Edenstar Saigon Hotel is located in the heart of Ho Chi Minh City, just a 5-minute walk from the famous Ben Thanh market, where you can buy everything from cool cucumbers to tiger balm. 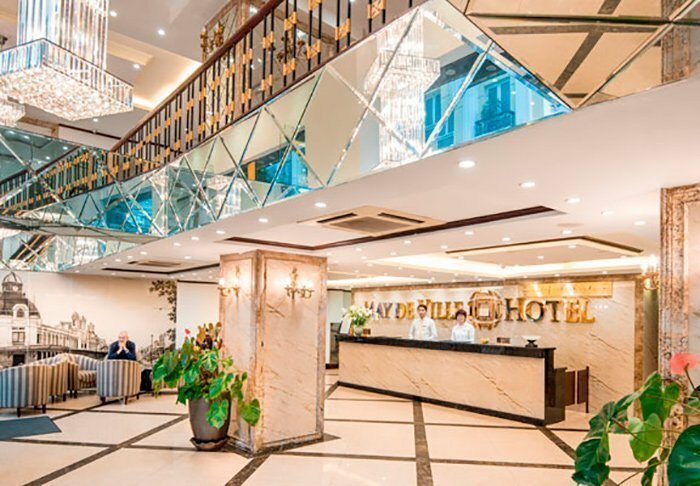 The hotel has 129 spacious rooms fitted with all modern conveniences such as a flatscreen TV, WiFi, air conditioning, minibar, safe and tea- and coffee-making facilities. 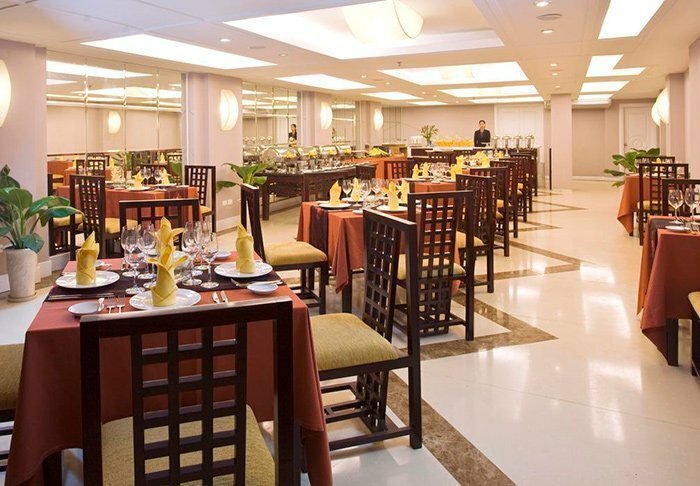 The hotel has its own restaurant where the breakfast buffet is presented. 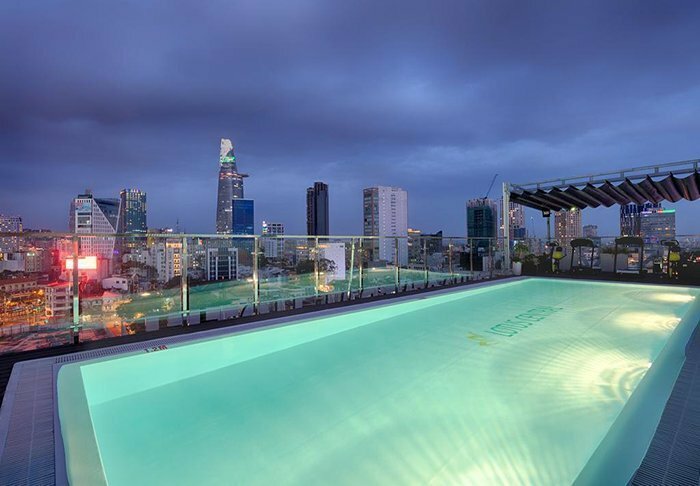 Other facilities include a fitness centre, conference room, spa department, bar, coffee bar, and a swimming pool on the 12th floor, which provides a wonderful view out over the bustling metropolis. 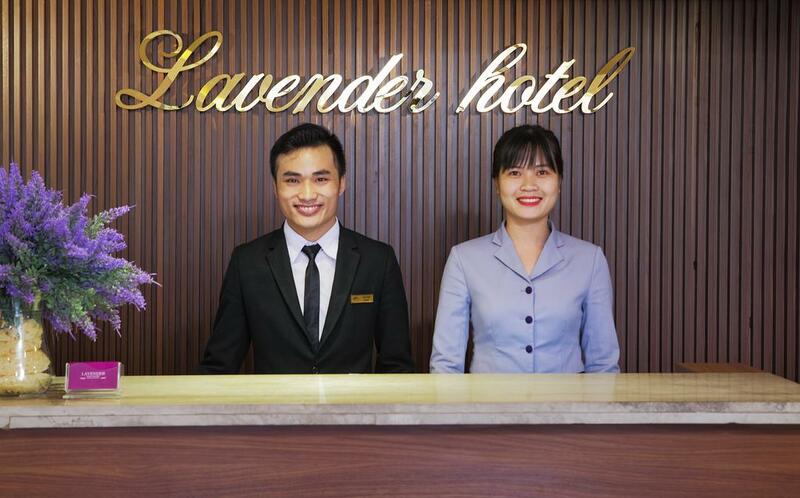 Lavender Anh Xuan Hotel is the newest of the three Lavender hotels in Ho Chi Minh. It enjoys an incredibly central location, just 20 minutes’ drive from the airport. Right on your doorstep, you’ll find shops and restaurants. 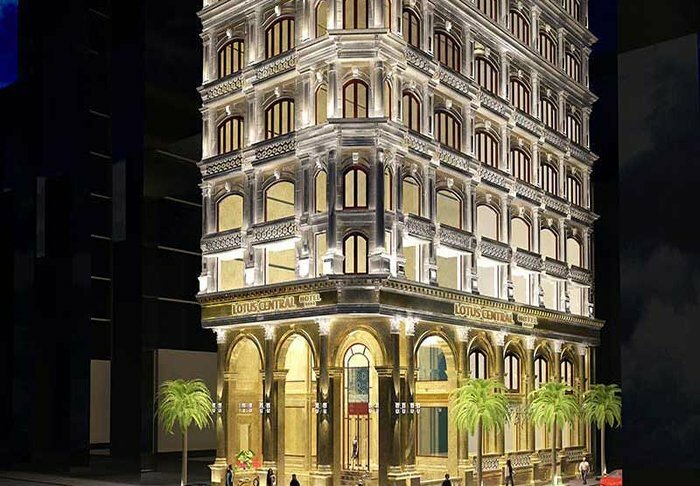 The hotel is also within walking distance of the city’s beautiful city hall, opera house and the Ben Tranh Market, where you can buy everything between heaven and earth. 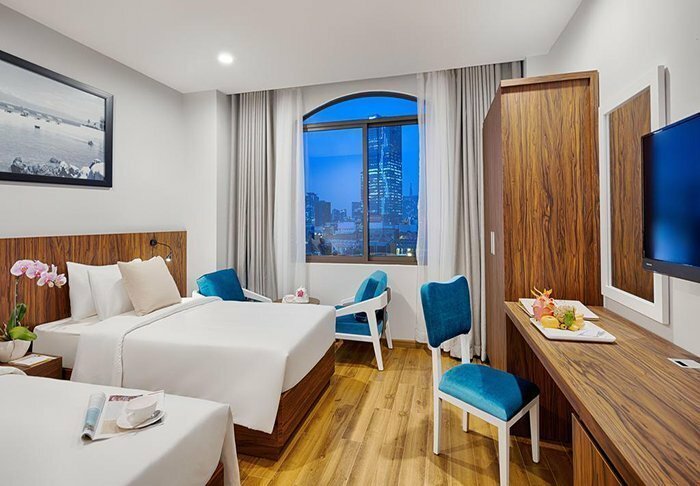 A 10–15-minute walk away are attractions such as the Reunification Palace, Notre Dame Cathedral and the city’s iconic building, Saigon Skydeck, from which you can enjoy the panoramic view of the city from the 49th floor. 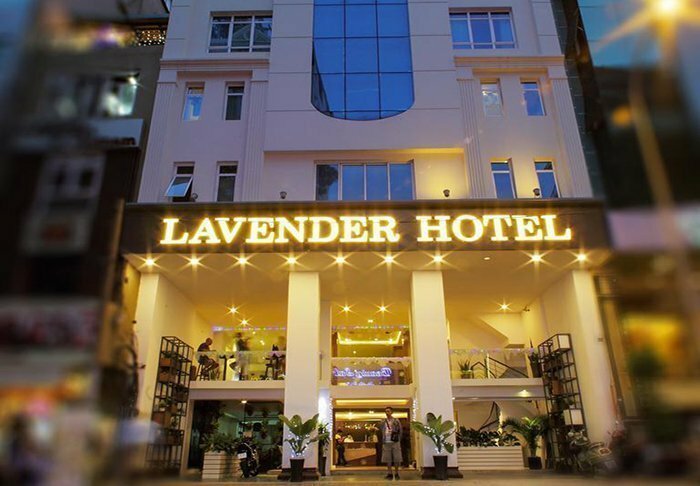 Lavender Anh Xuan has 70 comfortable, spacious and modern rooms with Wi-Fi, air conditioning, safe, mini bar, TV, telephone, coffee/tea making facilities and a hair dryer. The hotel also has a gym and restaurant. 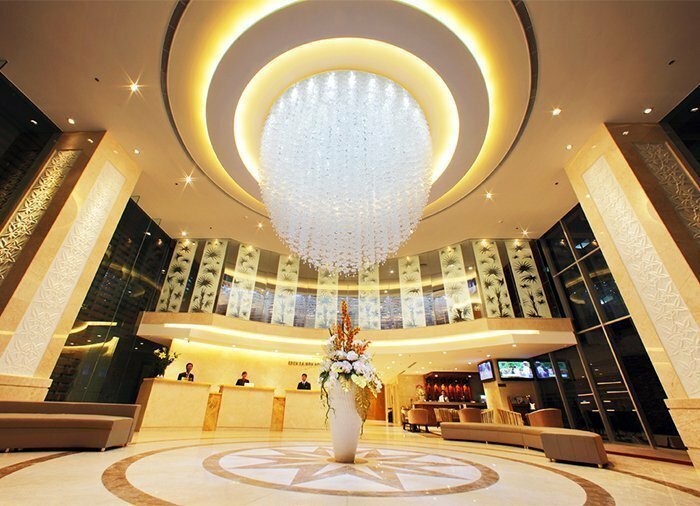 The doors to Lotus Central Hotel opened in 2018. 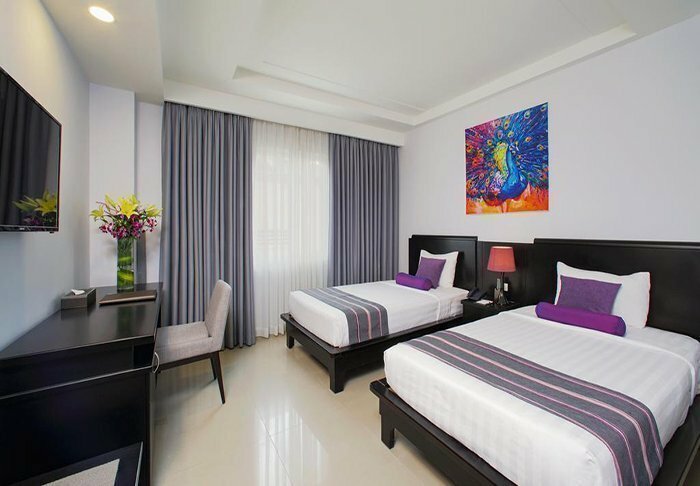 The hotel enjoys a super-central location, just 450 metres from the famous Ben Tranh market and 23/9 park, and there are shops and restaurants right outside. 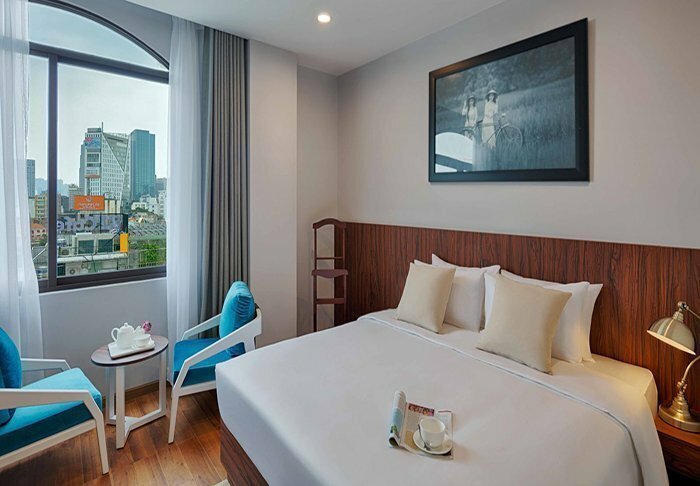 When staying at this hotel you are also within easy walking distance of the city’s popular attractions such as Notre Dame Cathedral, Reunification Palace, City Hall, the Opera House and the iconic building Saigon Skydeck, where you can enjoy a panoramic view of the city from the 49th floor. 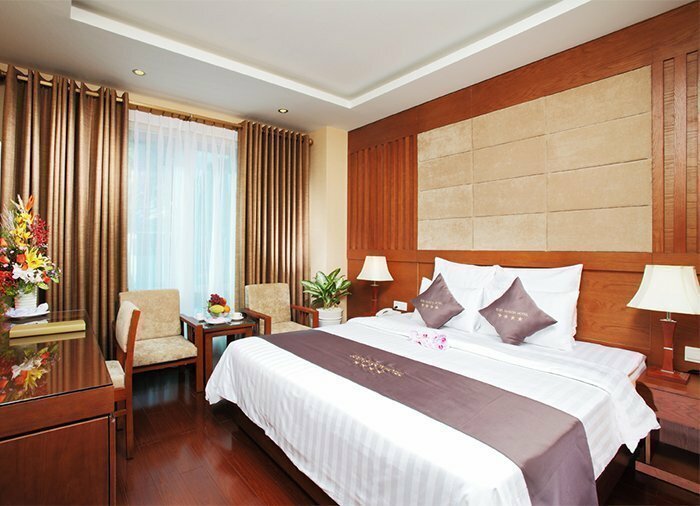 Lotus Central Hotel is a mix of contemporary and classic, which is also reflected in the 120 rooms. All rooms are equipped with Wi-Fi, air conditioning, a minibar, a safe, tea and coffee making facilities, a TV, a telephone and a free bottle of water per person every day. There are also bathrobes, slippers and a hair dryer. 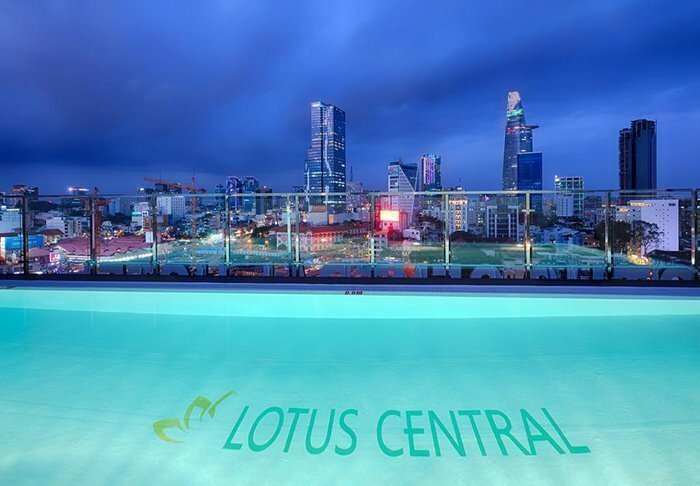 As one of the few 3-star hotels in the city, Lotus Central Hotel has a swimming pool. 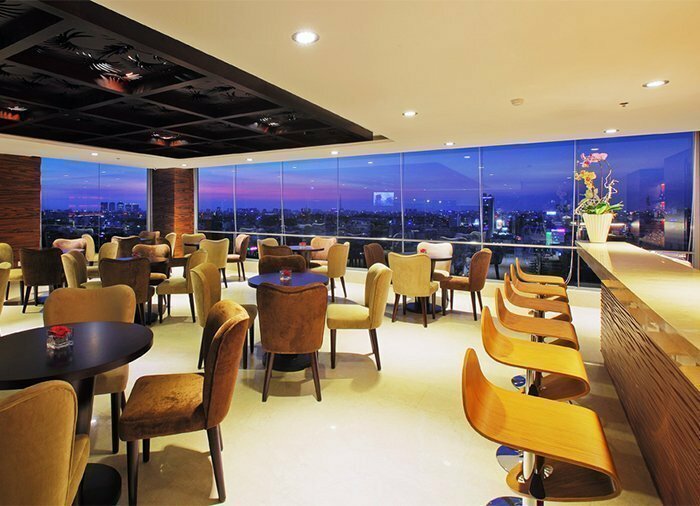 It is located on the 9th floor, offering panoramic views of the vibrant city. 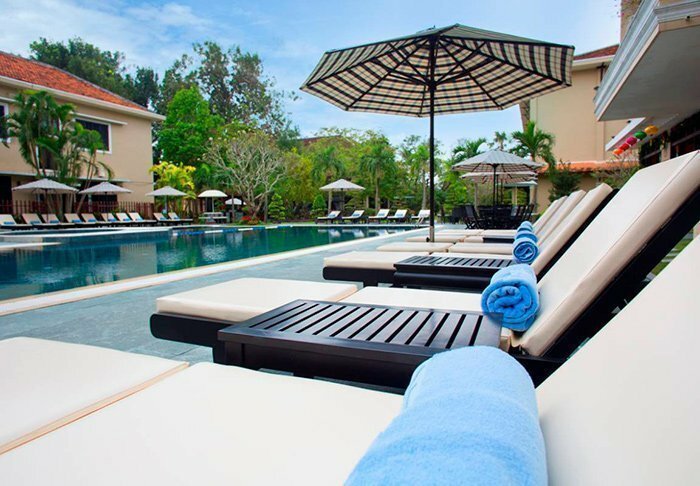 What better than to lie here with a drink from the pool bar at the end of day packed with experiences? Some might say a visit to the gym, which is located on the same floor. 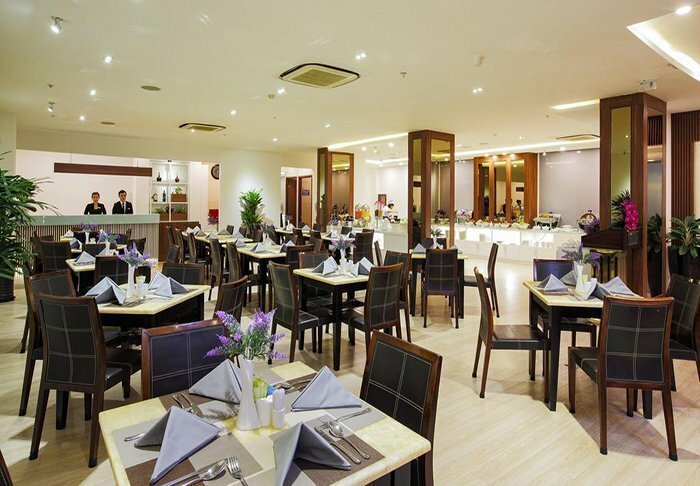 At the hotel’s Moon Restaurant, the staff are ready to serve you delicious Vietnamese and Western dishes. 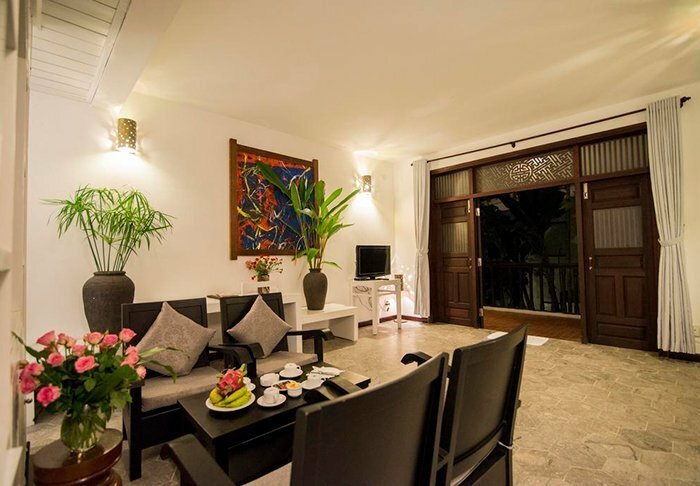 Ancient House Resort Hoi An is a delightful, family-run hotel in the heart of the old part of Hoi An. 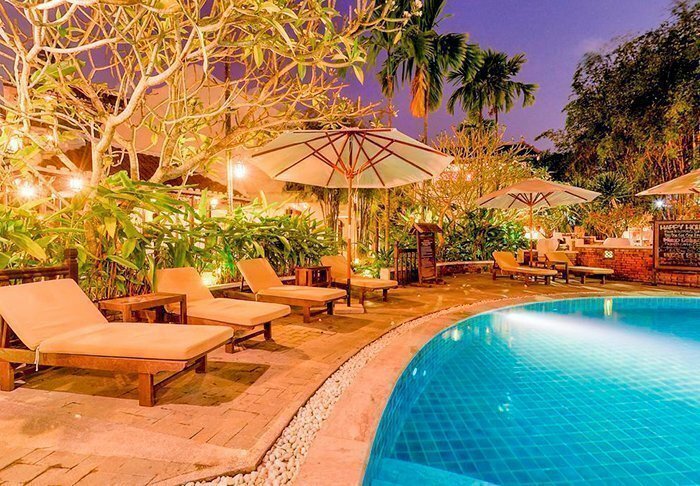 The resort is located in a giant garden that also contains a swimming pool. 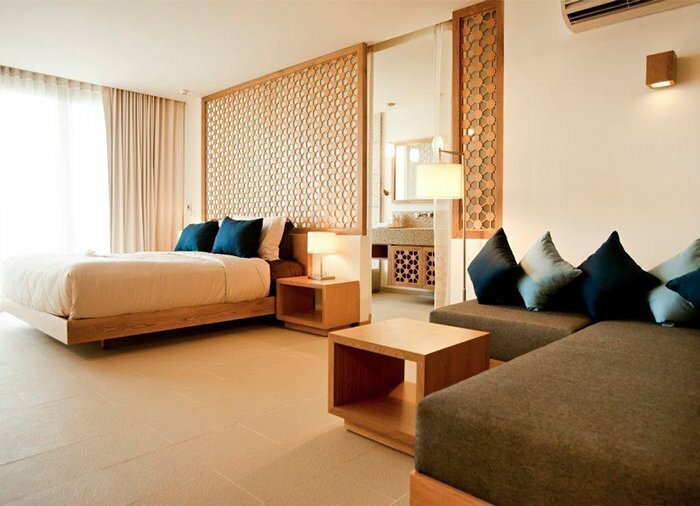 There are 52 rooms at the resort, all measuring at least 32 m2 and simply furnished in black and white. 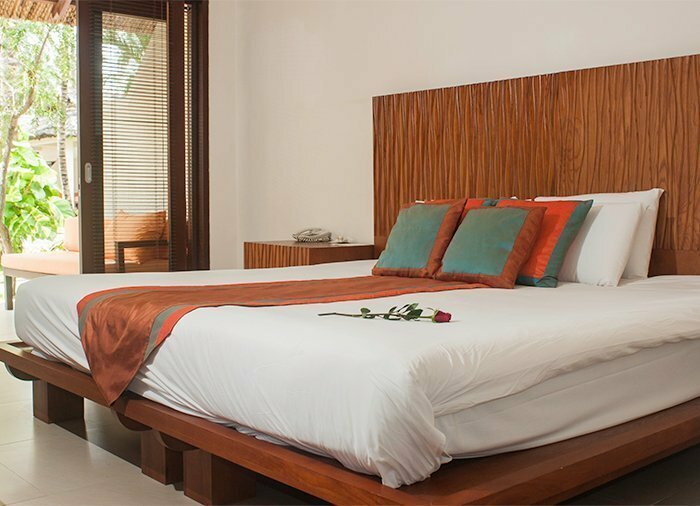 The rooms have their own bathroom, air conditioning, bed(s) with mosquito nets, satellite TV, Wi-Fi and a safe and minibar. 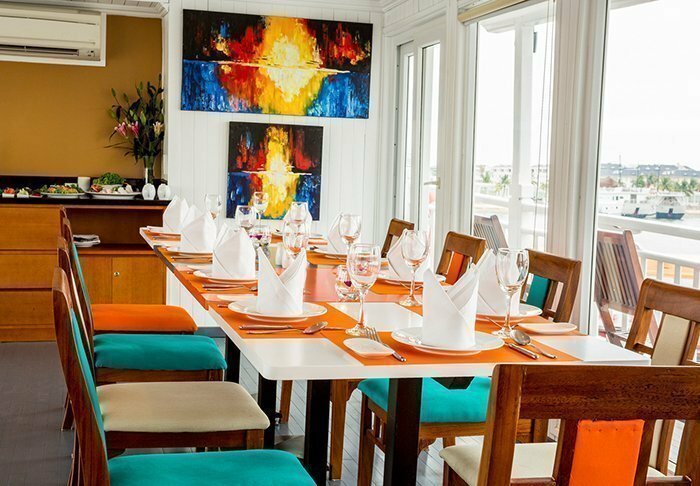 The hotel has a restaurant and shuttle bus that operates routes to the city centre and the beach. As an added bonus, you can see how a special tradition of craftsmanship in the culinary field is kept alive. The family is more than happy to demonstrate how, over the generations, they have developed techniques for refining rice so that it can be used in dishes such as my quang (quang noodles), hu tieu (fish soup), bun (vegetable soup), banh dap (thin, crsip-like rice cakes, steamed and toasted), and cao lau and pho (noodle soups). 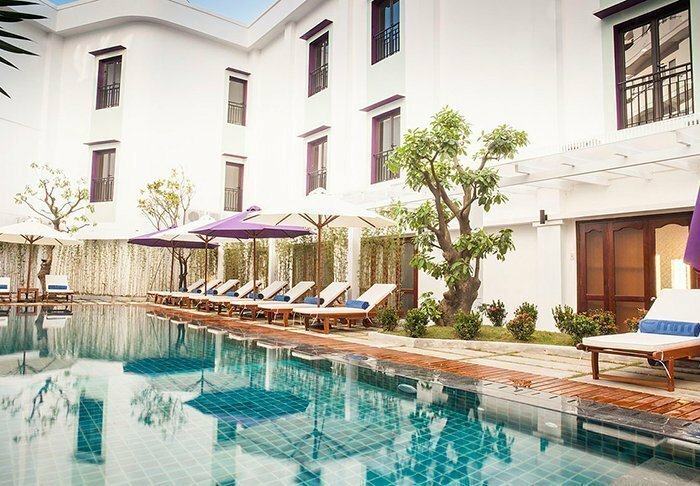 This hotel is located in the old part of Hoi An, within easy walking distance of the city’s sights and attractions. 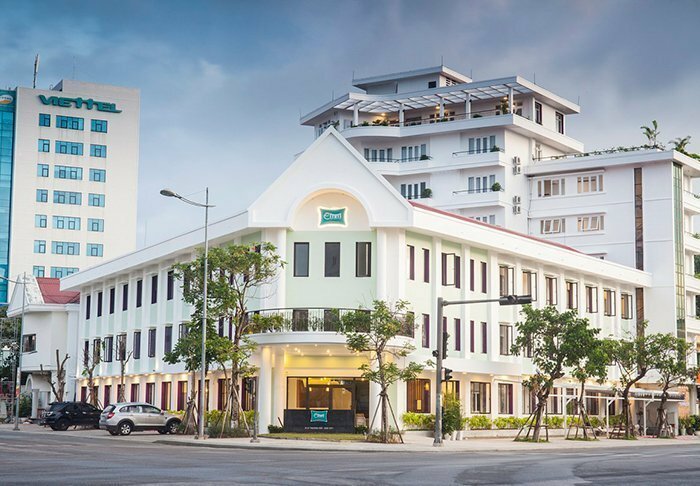 The hotel is famous for its design, which features strong, clear colours, and its architecture that comprises an interesting mix of French and Vietnamese influences. 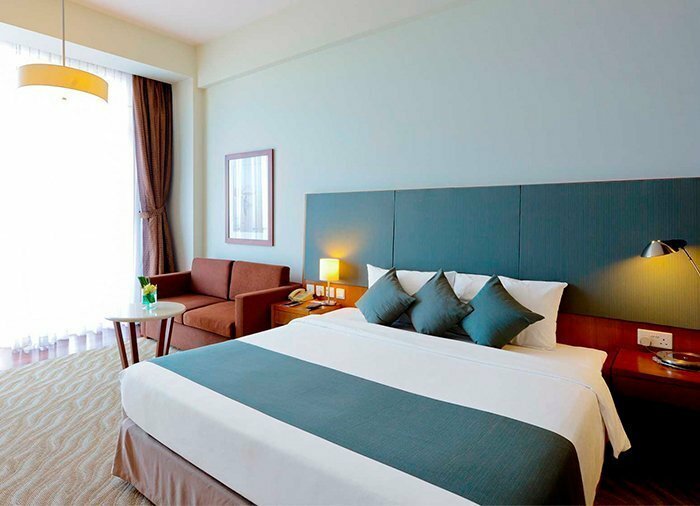 The hotel has 92 rooms equipped with a flatscreen TV with satellite channels, a telephone, air conditioning, minibar, safe, tea- and coffee-making facilities, as well as free WiFi. 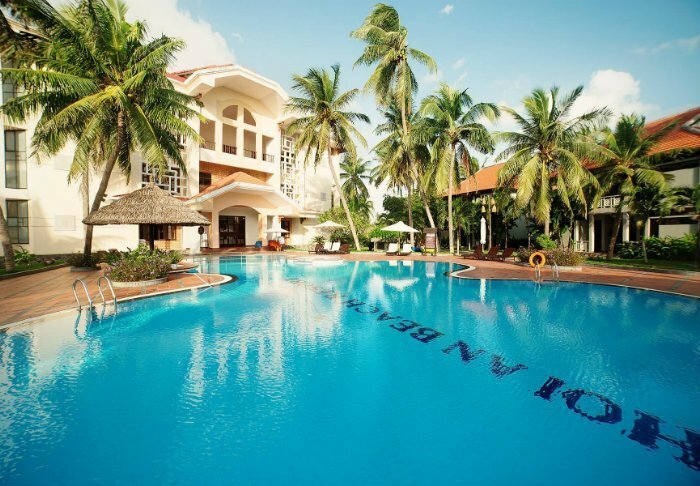 Facilities at the hotel include a large swimming pool with sun loungers, a bar and a restaurant. 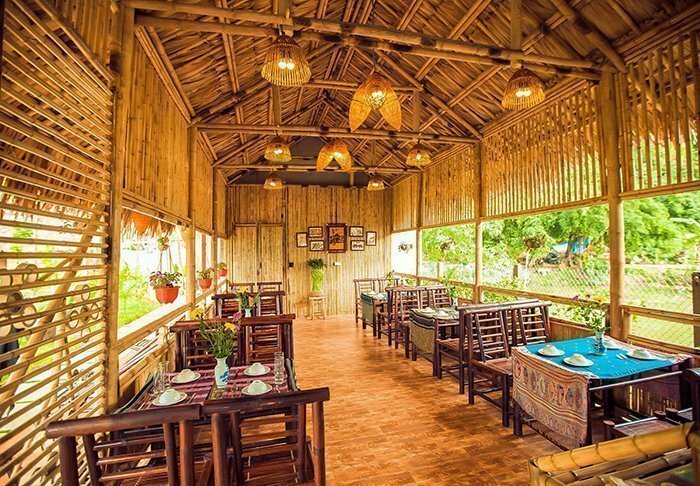 Restaurant YÊN serves breakfast and dinner. You can choose to sit indoors or move outside and enjoy your meal by the pool or in the small garden. 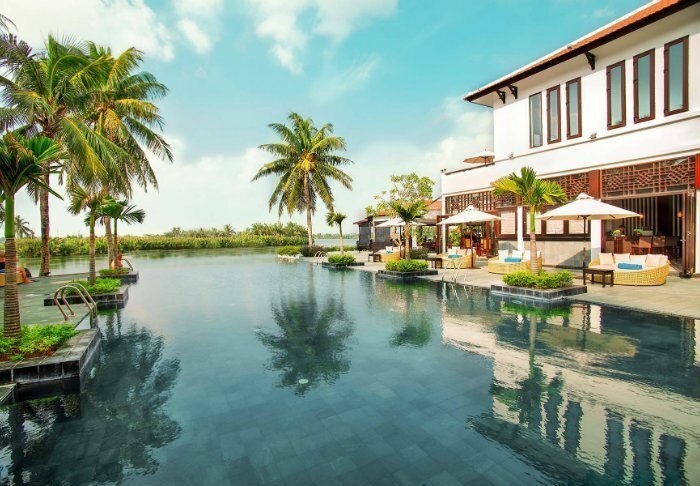 Hoi An Beach Resort is situated in an oasis of peace and quiet 4 km from the old quarter of Hoi An with the De Vong river on one side and the Cua Dai beach on the other. 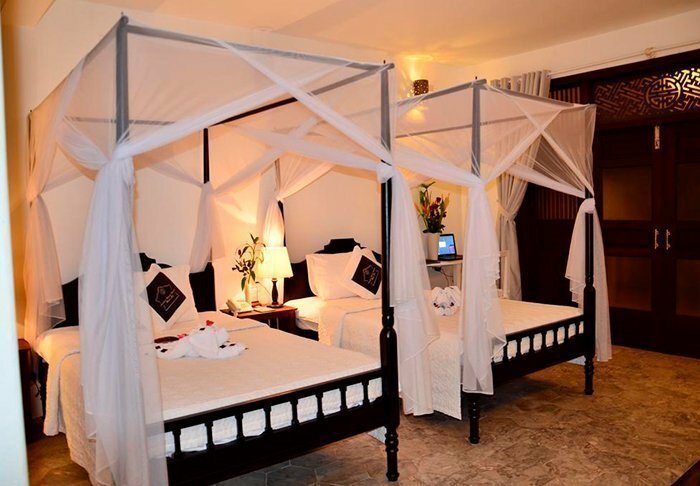 The resort has 121 comfortable rooms with Wi-Fi, air conditioning, mini-bars, safes, TV, telephones, tea and coffee facilities and bathrooms with hair dryers and slippers. 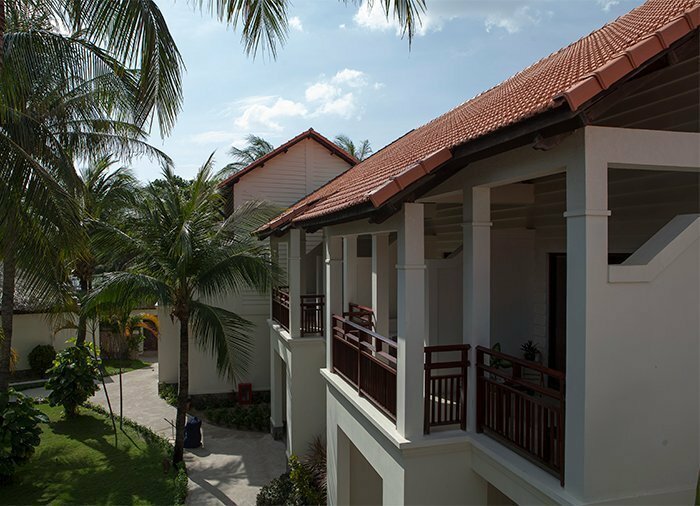 On the balcony, you can enjoy the calm and the view of the well-kept gardens. 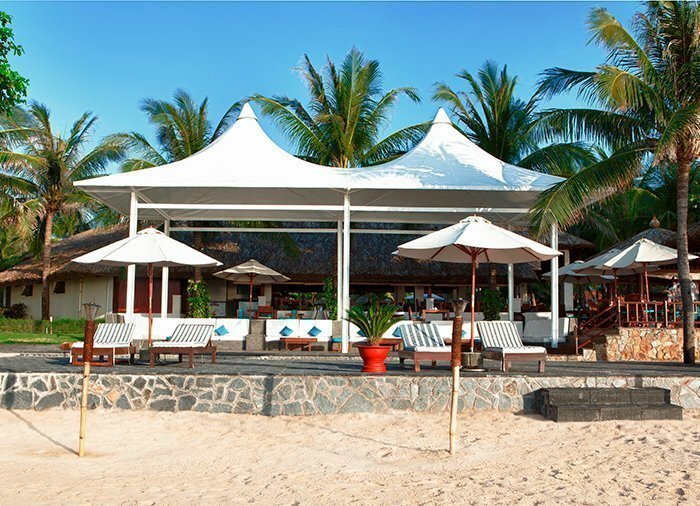 Hoi An Beach Resort has a private beach with loungers and parasols as well as a beach bar that serves drinks, snacks and light meals. 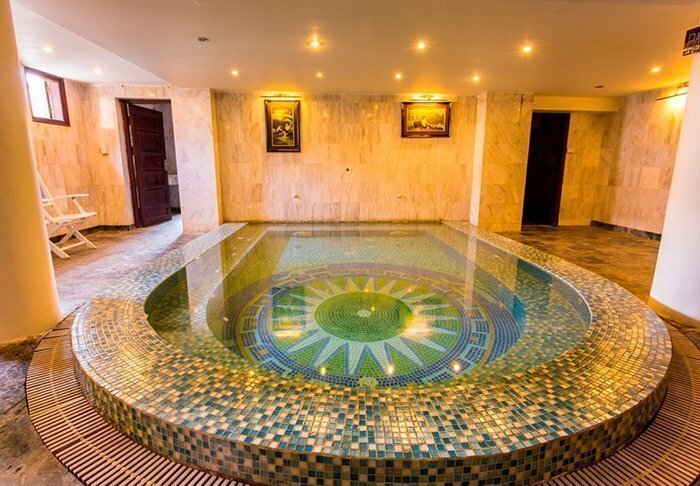 If you prefer pools, the resort has two of these and one even has a separate children’s pool. There are also opportunities to play both beach volleyball and soccer, and if you would like to explore the area, you can rent bicycles. 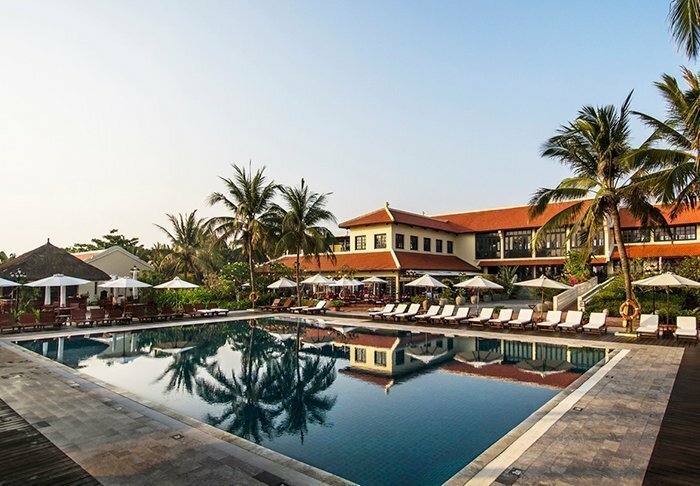 There is also a free shuttle bus between the resort and the old district of Hoi An. When the thirst and hunger come in force, there are many options to choose from. 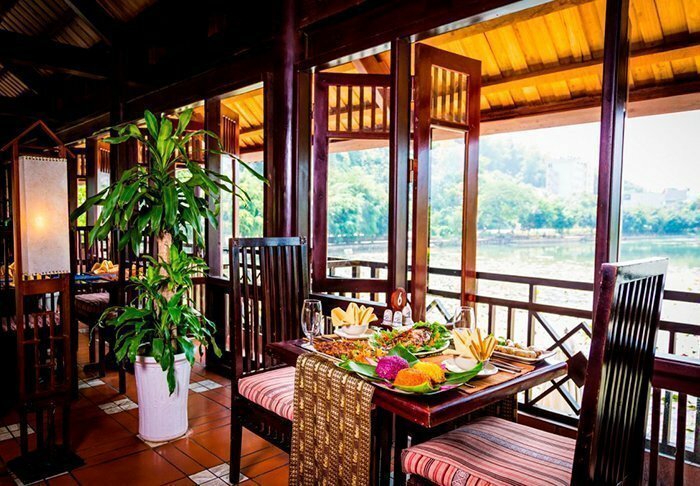 River Breeze Restaurant is located by the De Vong river and has a fantastic view. 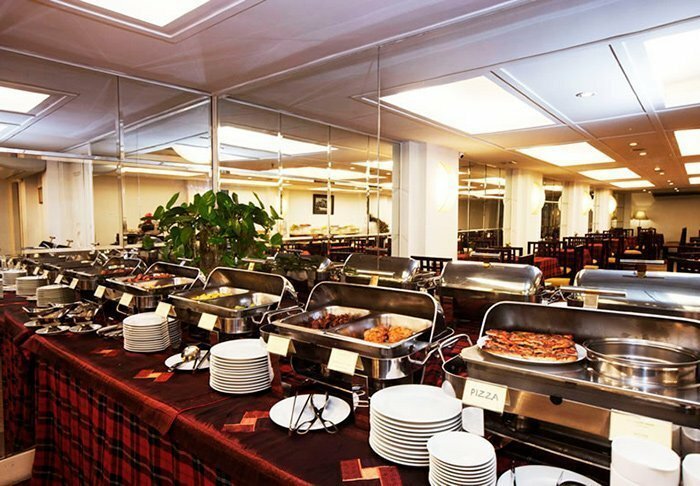 Here both a buffet and an a la carte menu are available with Vietnamese and Western dishes. 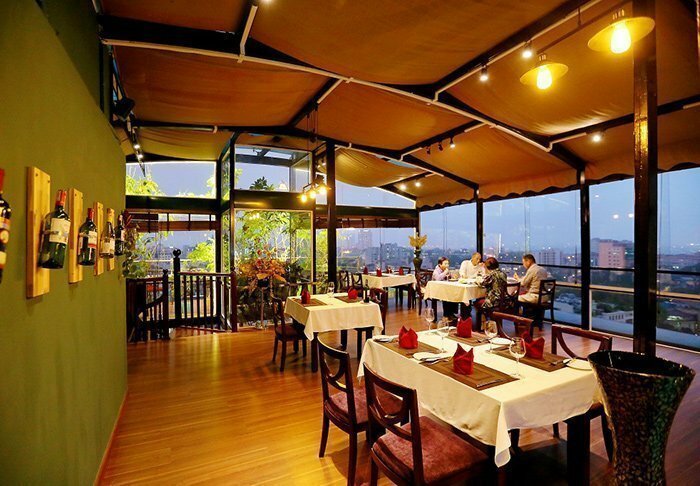 On the floor above River Breeze is the restaurant Sunset Grill, which has specialised in Western barbecue dishes. 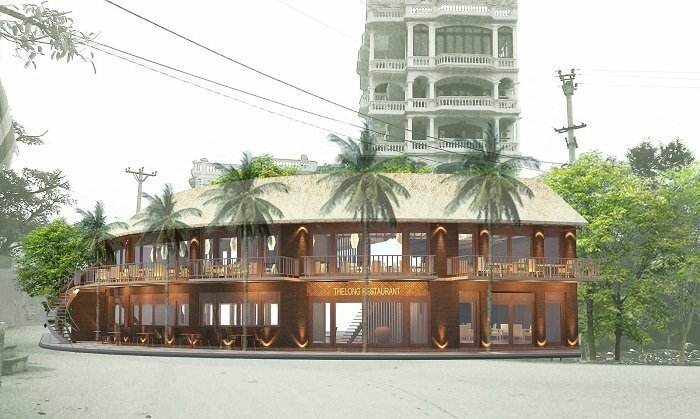 Mangrove Bar and Sunshine Bar serve drinks and snacks. If you would like to treat yourself, you can book time at Waterlily Spa, which offers lovely, relaxing treatments. Further facilities include a fitness room and souvenir shop. Please note that from the end of September to the beginning of March, there is not much beach in front of the hotel, which is due to seasonal winds and rain. 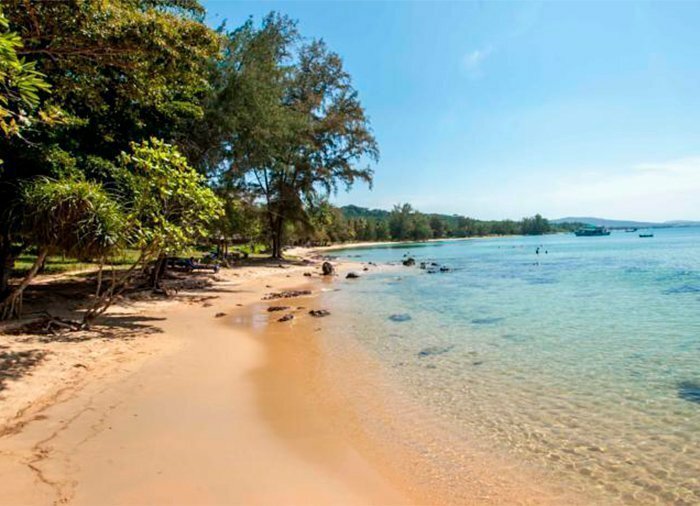 During this period, the hotel offers a free shuttle bus to the lovely An Bang beach, 3 km away. 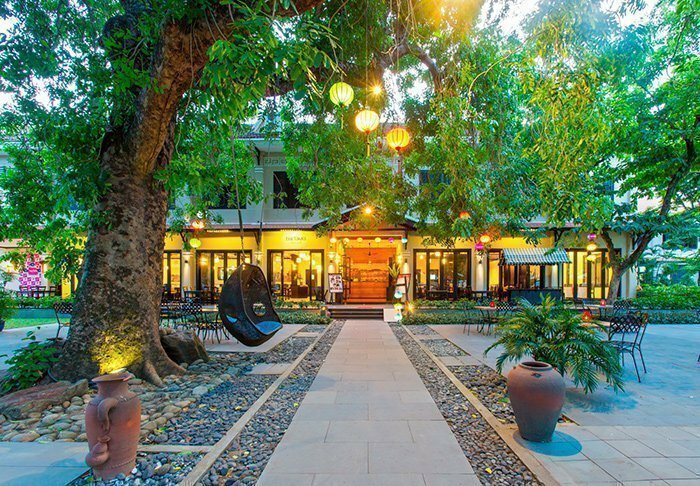 In the heart of Hoi An’s old town in a leafy, shady area, you will find the charming Hoi An Historic Hotel. 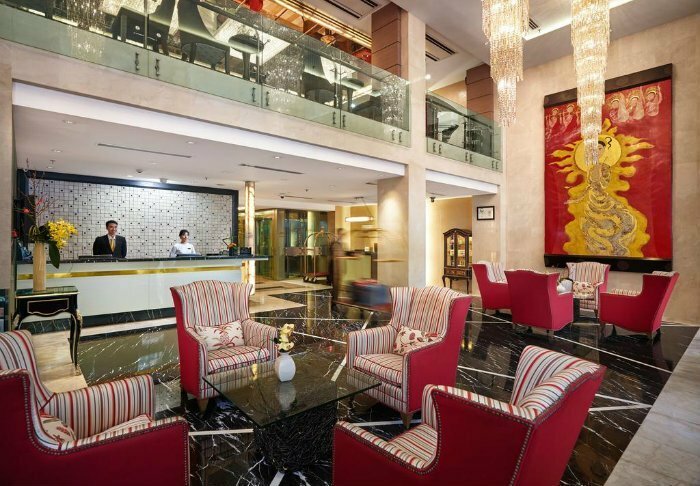 The admirable location is perfect when you want to be within short walking distance of the city’s many attractions. 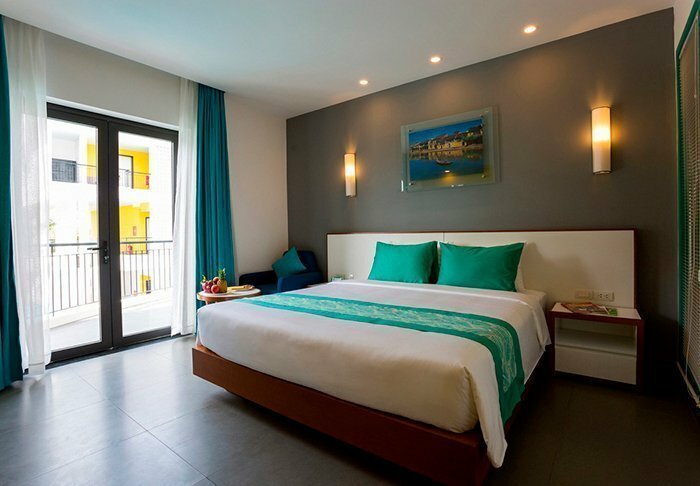 The hotel has 150 elegantly designed rooms, traditionally decorated in bright colours and with modern facilities. 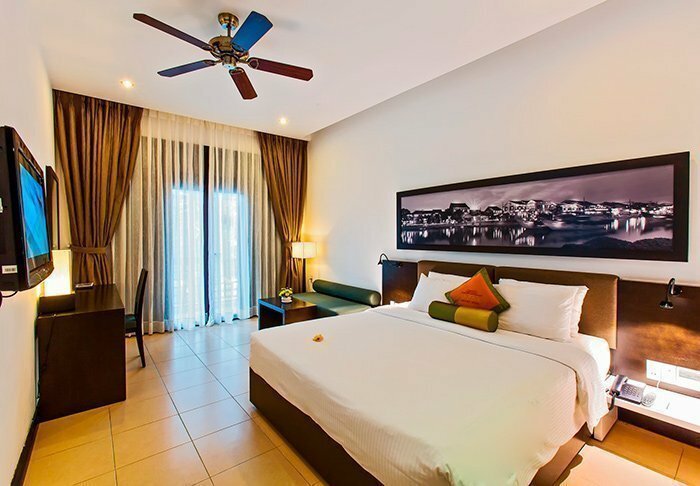 All rooms have air conditioning, a ceiling fan, a TV, a safe, a mini fridge and tea/coffee making facilities. 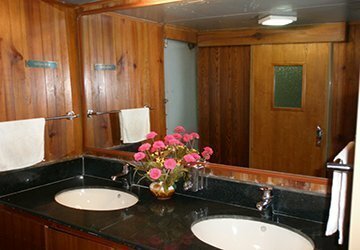 You will also find bathrobes, slippers, hair dryers and toiletries in the lovely spacious bathroom with both a bath tub and separate shower. Facilities at the hotel include a large outdoor swimming pool, a fabulous spa bath, tennis courts, a gym and a salon where you can purchase beauty and spa treatments. 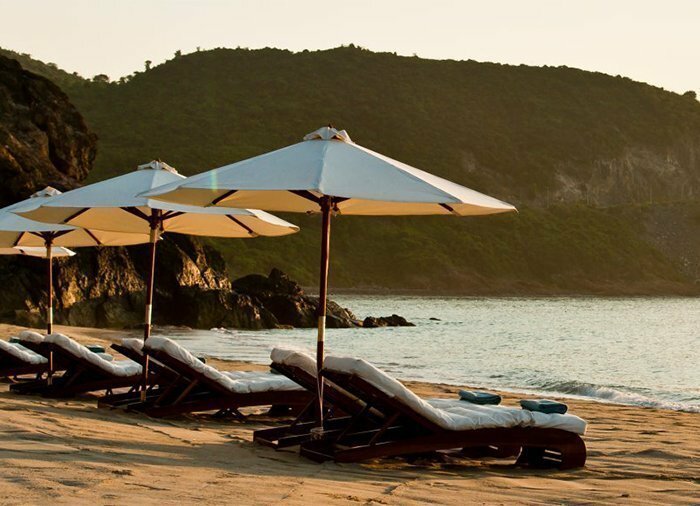 If you tire of relaxing in the sun loungers by the pool, a free shuttle bus runs every 15 minutes to Cua Dai Beach, just 4 km from the hotel. 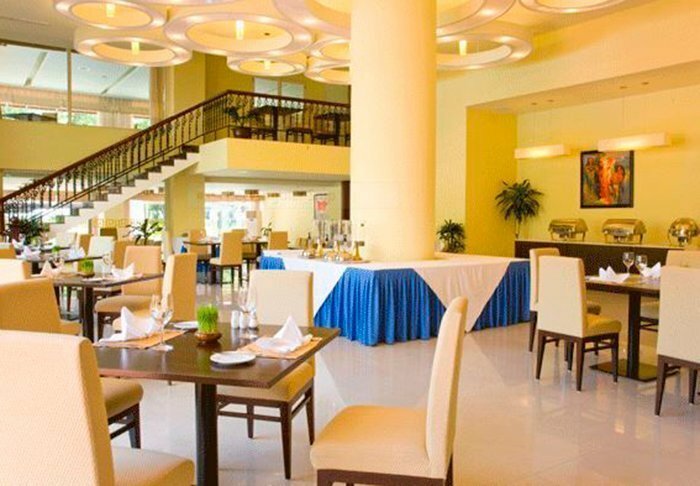 The hotel has several restaurants and bars: At The Oaks Terrace restaurant, you can enjoy international cuisine, indoors and out. 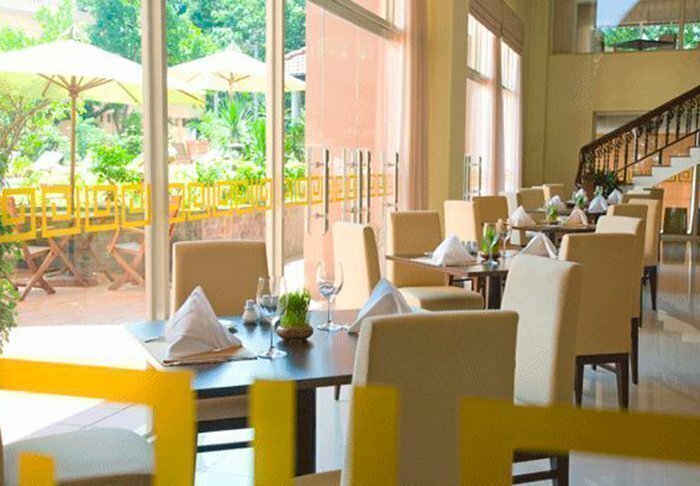 Restaurant Indochine Corner serves traditional Vietnamese cuisine and is set amidst the tropical garden. 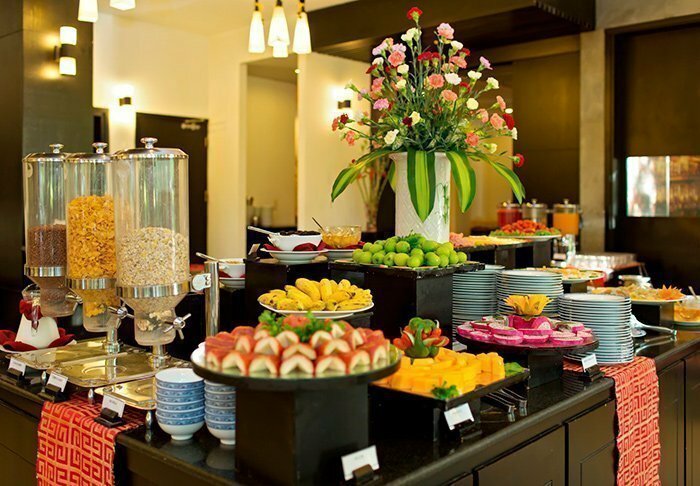 It is also here that you will find the breakfast buffet offering a wide selection of Asian and Western dishes. In the indoor Western Bar, which is decorated in warm, inviting colours, you can enjoy Italian specialities with your drink, while there is also a small bar in the garden serving a large selection of drinks. 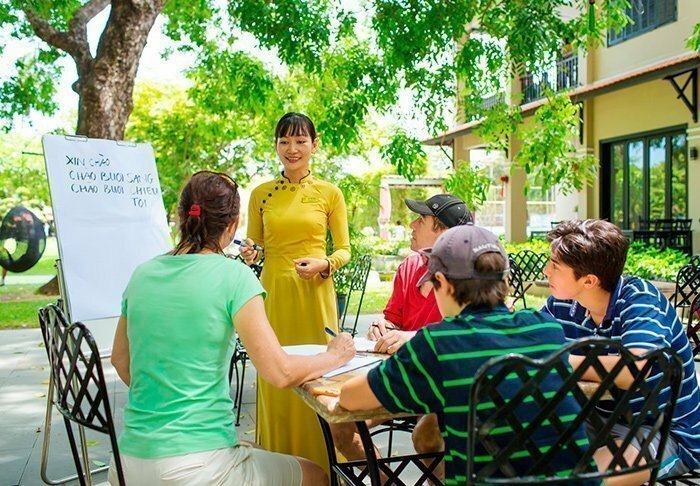 If you feel the need for a little activity during your stay, you can participate in various courses in the hotel garden for an additional fee. 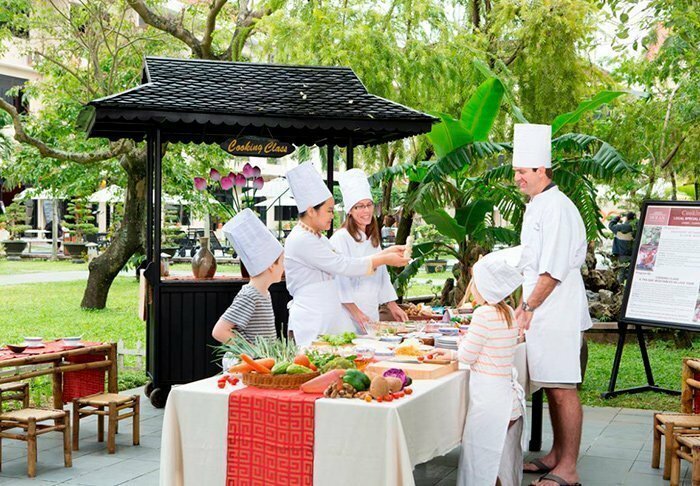 You can learn the most common Vietnamese phrases on a short language course or learn how to make traditional Vietnamese dishes on the hotel’s cooking course. On selected mornings, you can try your hand at relaxing Tai-chi. 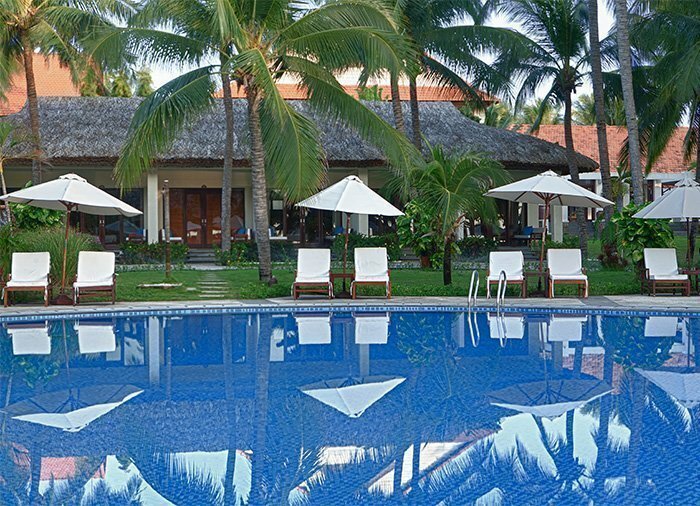 Victoria Hoi An Beach Resort is located around 5 km from Hoi An. 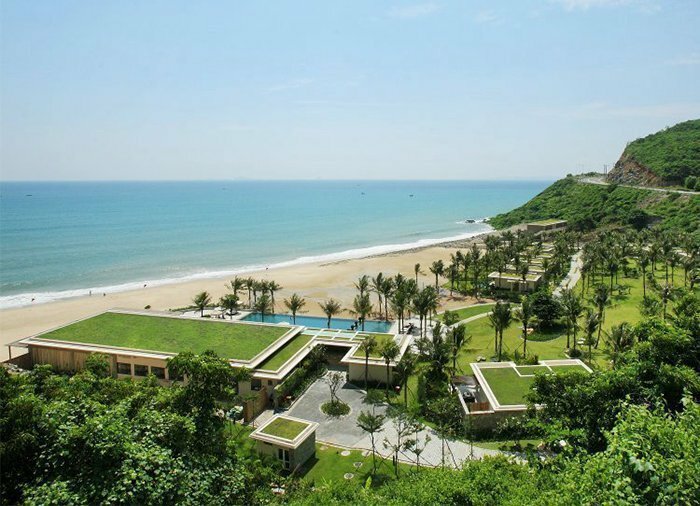 One side of the resort faces the sea, while the other side faces the Thu Bon River. 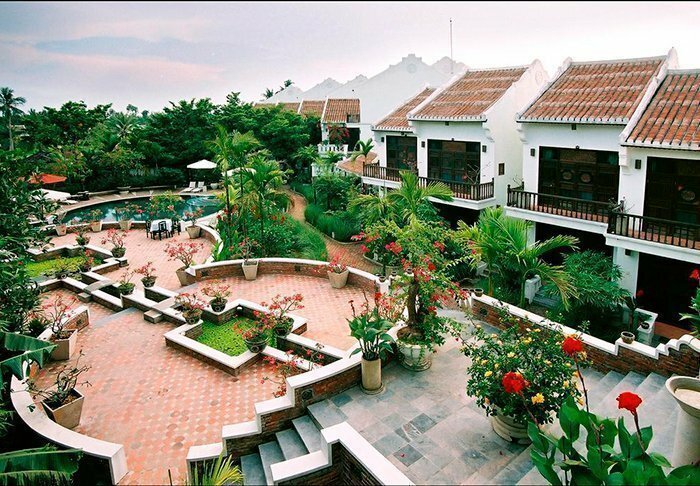 The hotel has 109 rooms and is built in a charming style that blends Vietnamese with Japanese, Chinese and French. 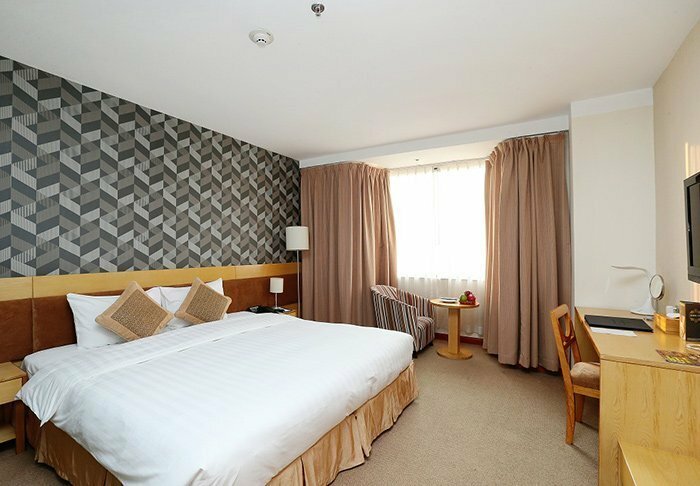 The rooms are bright and spacious and equipped with Wi-Fi, air conditioning, mini bar, TV, telephone, safe and coffee/tea making facilities. On one of the days, you should treat yourself to a massage in the day spa. Afterwards, you can relax in the jacuzzi overlooking the blue sea or swim in the pool, which is surrounded by sun loungers and parasols. Other facilities include a gym, tennis courts and a children’s club. There are in addition a number of water sports activities on offer. 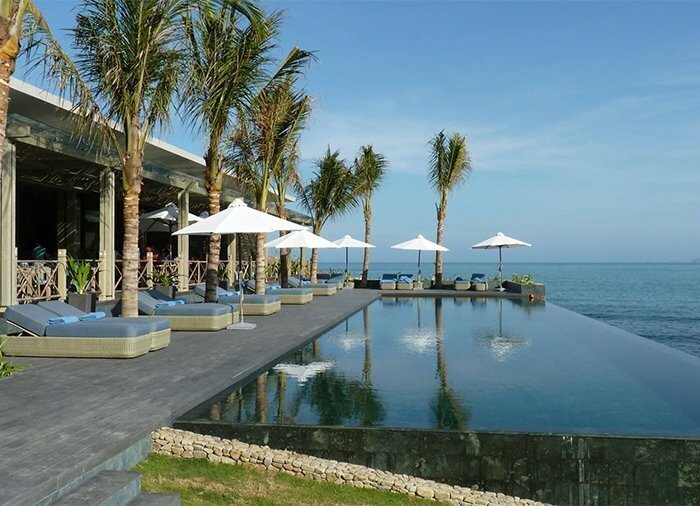 The hotel has both restaurants and bars: Overlooking the sea, Restaurant L’Annam serves Vietnamese and international cuisine, while the Faifo Bar serves light meals and drinks by the pool or on the beach. In the evenings you can enjoy live music and the chilled atmosphere of the Cham Bar. 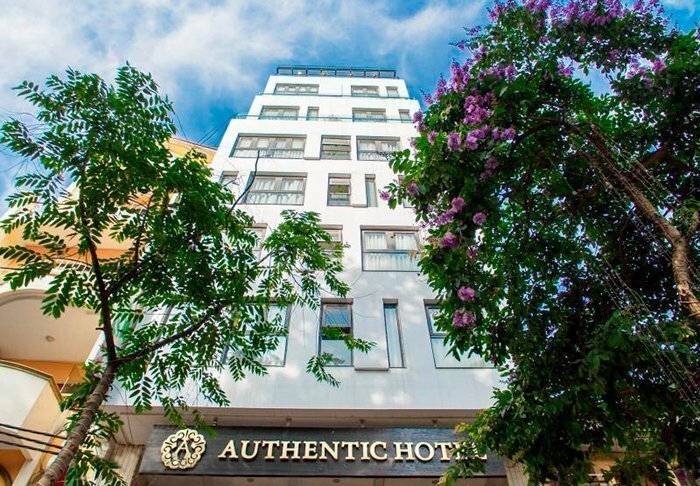 This excellent 3-star hotel can be found in the centre of Hué. The hotel is within walking distance of the river, though rental bicycles are also available in case you wish to take a longer trip. The ground floor houses a pleasant little courtyard with a pool and bar area. The hotel has its own restaurant. 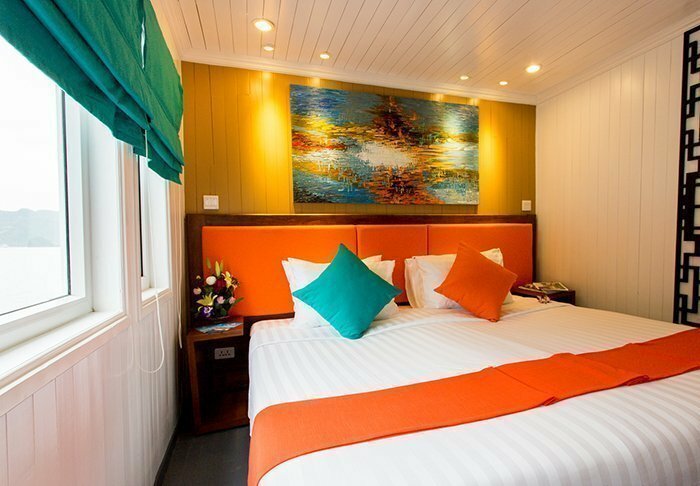 The rooms are decorated in bright colours and are comfortably spacious. 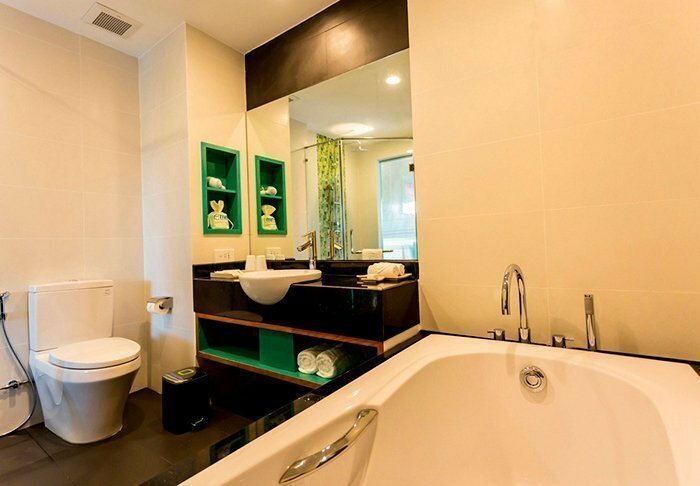 All rooms have their own bath/toilet, air conditioning, tea/coffee, Wi-Fi, TV, mini bar, hair dryer and safe. 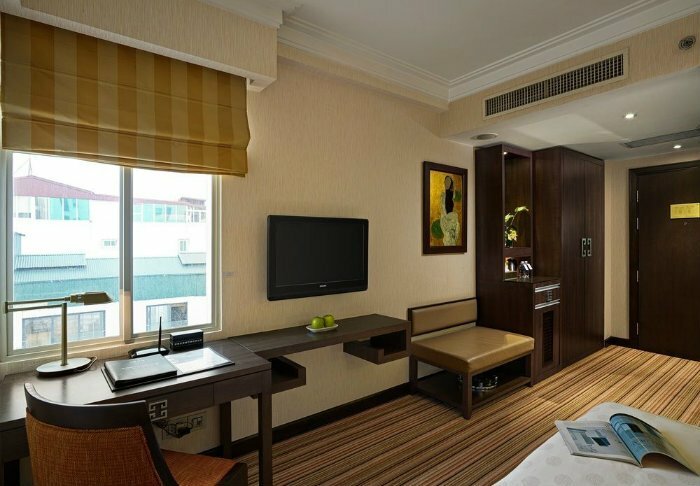 The 4-star Park View Hue Hotel enjoys a central location in Hue, close to the citadel that you can admire from the ninth floor of the building. 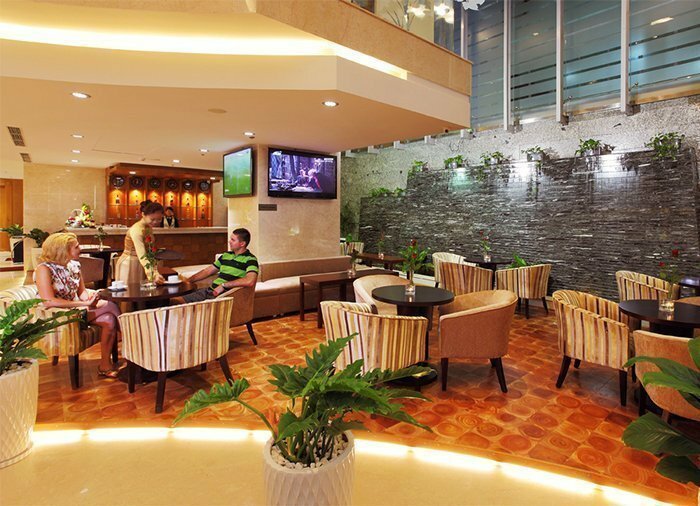 The hotel is within easy walking distance of The River of Scents and the shopping areas in Hue. Facilities at the hotel include restaurants, bars, a spa and a fitness centre. 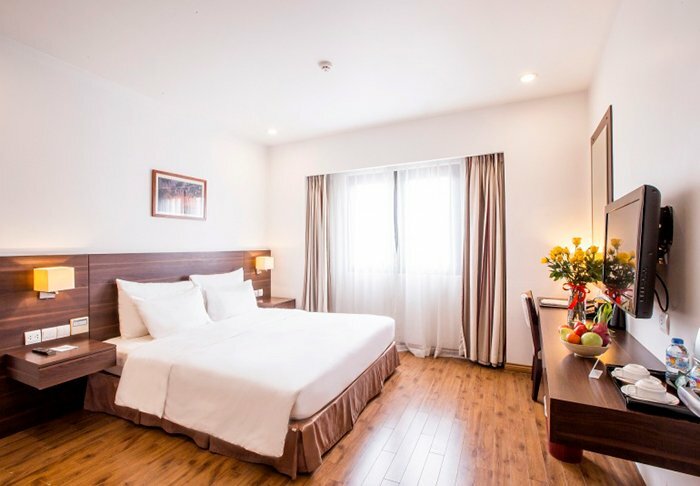 The tour is based on a stay in a superior room which measures 32 m², has its own bathroom with a hair-dryer, and features a full range of modern conveniences including air conditioning, a minibar, a safe and facilities for making tea and coffee. 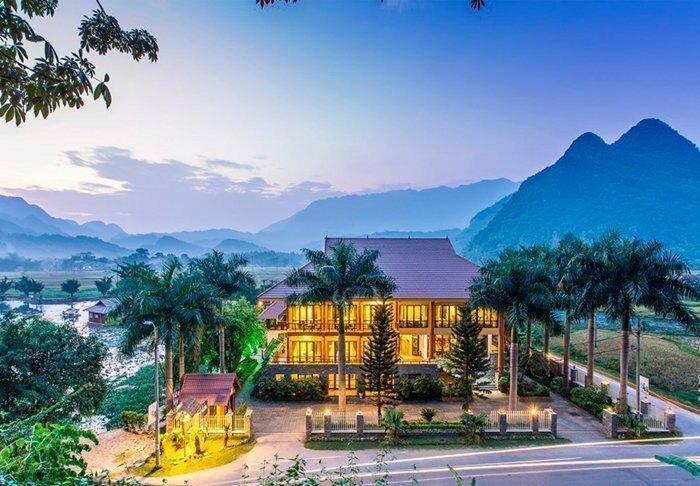 Mai Chau Lodge is a special place, providing both cultural delights and pure relaxation in the heart of an area of magnificent countryside. 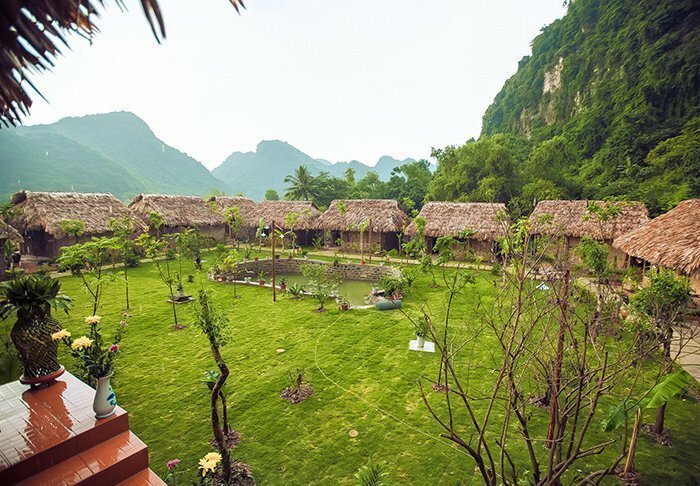 Simply put, Mai Chau Lodge is a little piece of paradise among ethnic minority villages in the Mai Chau Valley. The special mix of history, culture and countryside – combined with a suitable helping of luxury and modern conveniences – allows you to brush off the stresses and strains of everyday life and slip into the gentle rhythms of another part of the world. 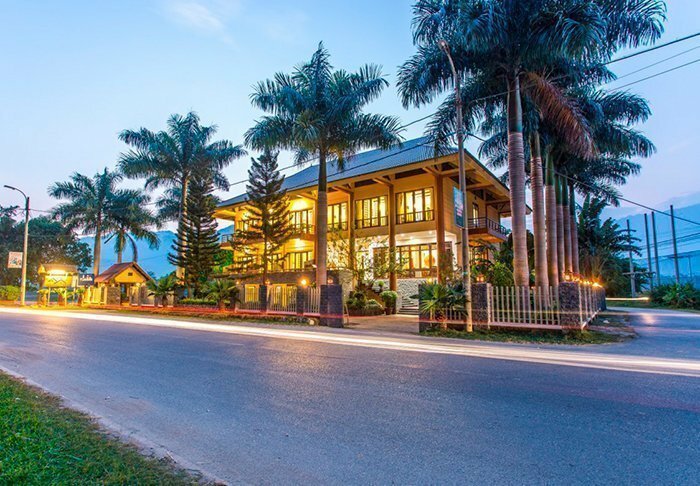 The lodge stands in singular majesty overlooking the valley and comprises 16 rooms fitted out in modern, international style. 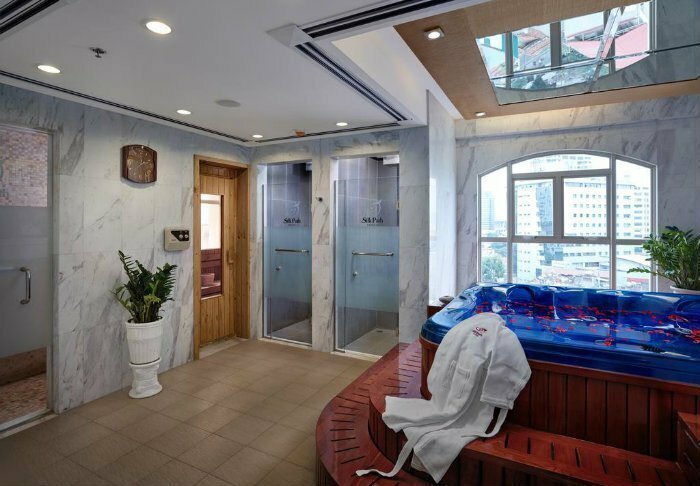 They have their own shower room with a hair-dryer, and in-room conveniences include Wi-Fi, satellite TV, a telephone and facilities for making tea and coffee. 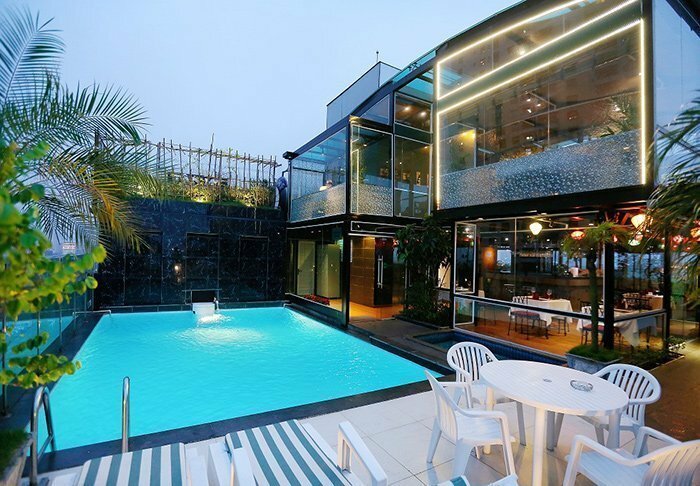 The lodge has a swimming pool, jacuzzi, sauna and restaurant. 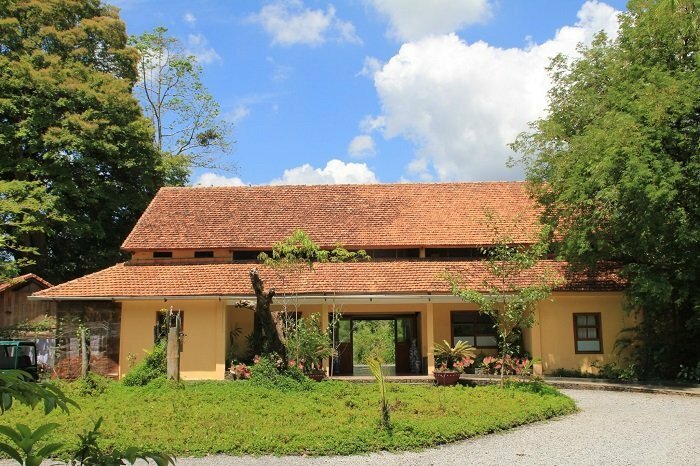 Forest Floor Lodge is a unique ecological hotel and resort located in the outskirts of Nam Cat Tien National Park. The lodge has everything you need for a thoroughly pleasant stay. 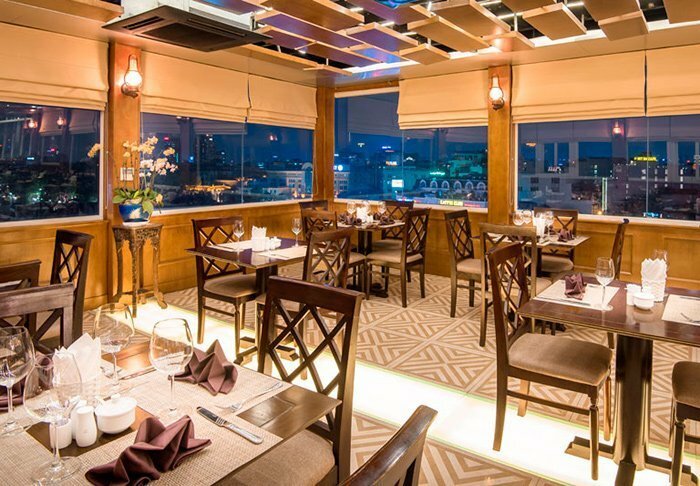 Facilities include a fine restaurant, a bar and a vantage platform from which you can admire the view out over the river. 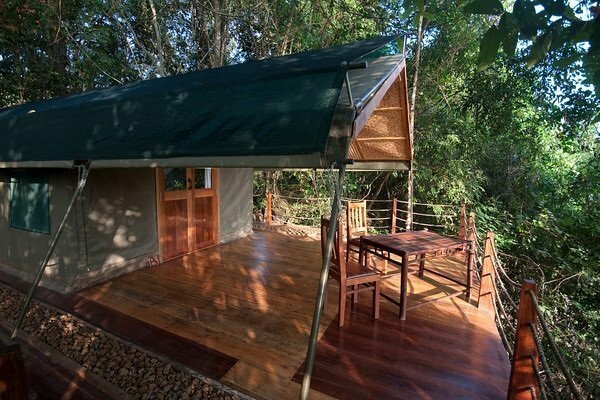 Accommodation is in luxury tents specially designed for tropical conditions. 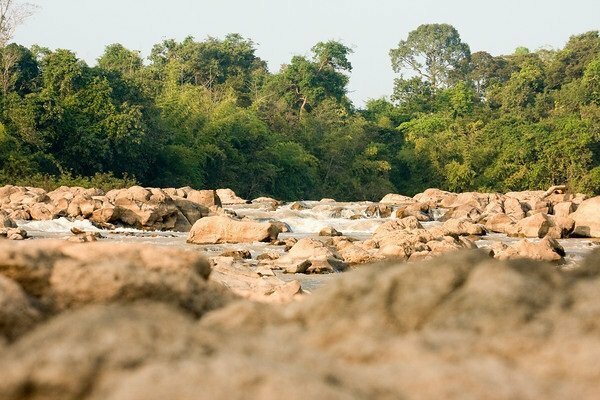 The tents are raised above the ground on a wooden platform and command an excellent view of the Ben Cu rapids. 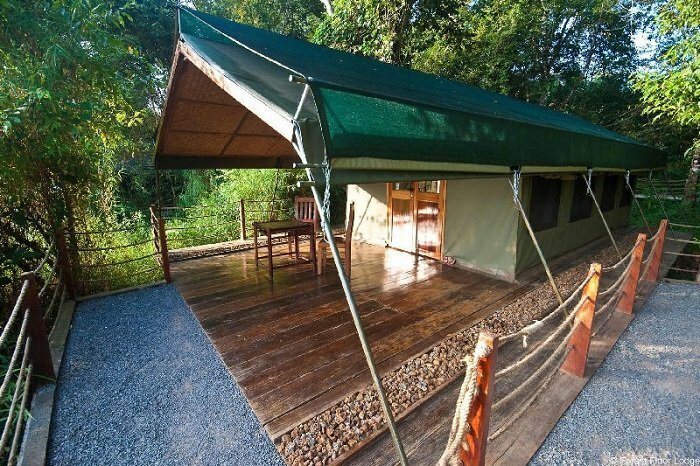 The tents are linked to the main building at the lodge by a network of walkways. All tents are equipped with either one double bed or two singles and have their own bathroom, air conditioning, a fan and a minibar. In front of each tent there is a charming balcony furnished with a couple of chairs – perfect for admiring the sunrise over the river and listening to the call of the gibbons. 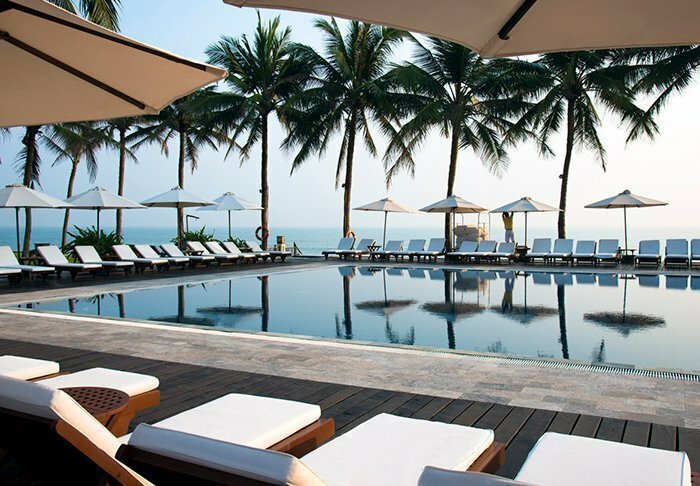 The deluxe, 5-star Mia Resort is located right next to the beautiful Bai Dong beach. 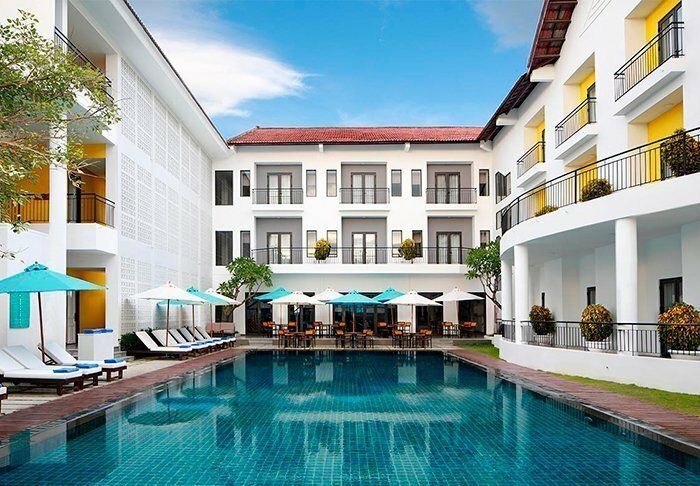 This is the perfect place to round off your trip with a healthy helping of luxury. 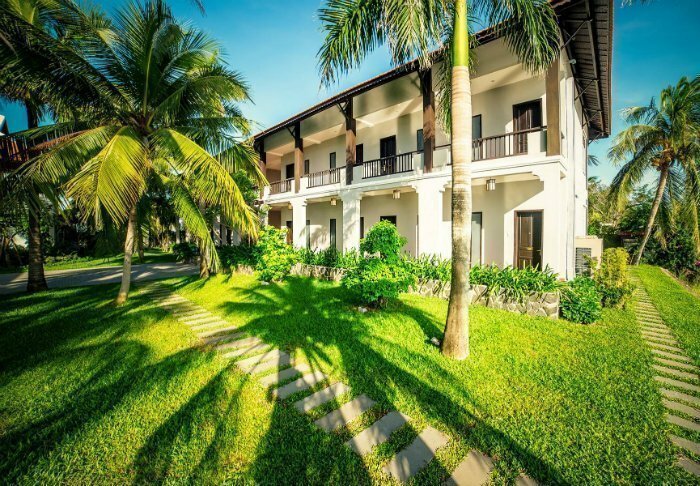 The resort has 70 rooms of various sizes, all set in a tropical garden with a view of the sea. 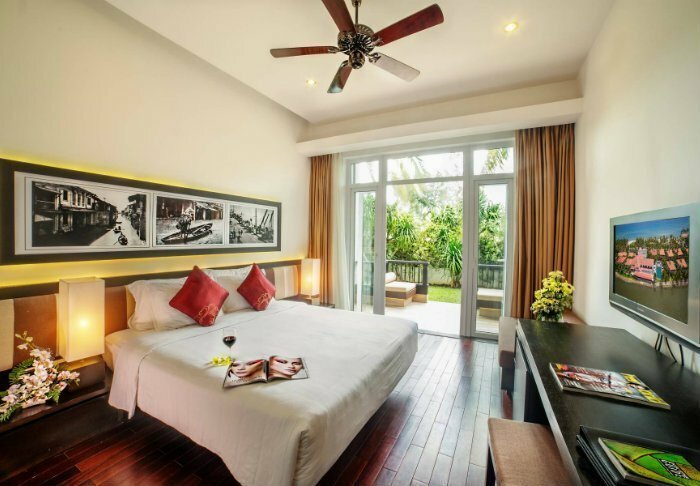 The rooms are beautifully furnished in natural materials and feature air conditioning and Wifi. 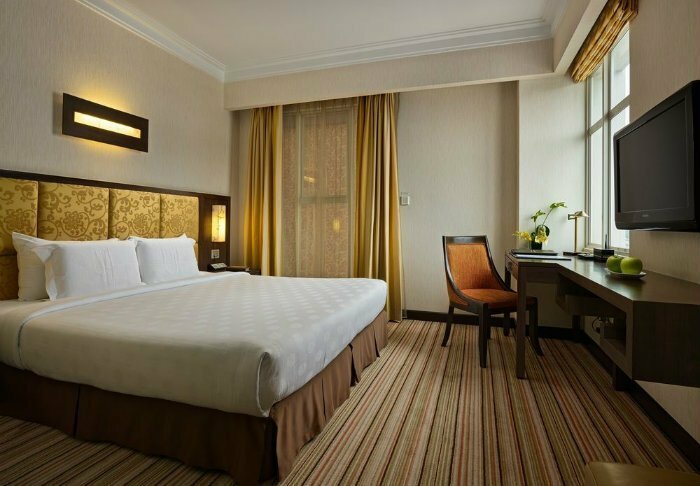 In-room conveniences include a safe, minibar and cable TV, as well as tea- and coffee-making facilities. 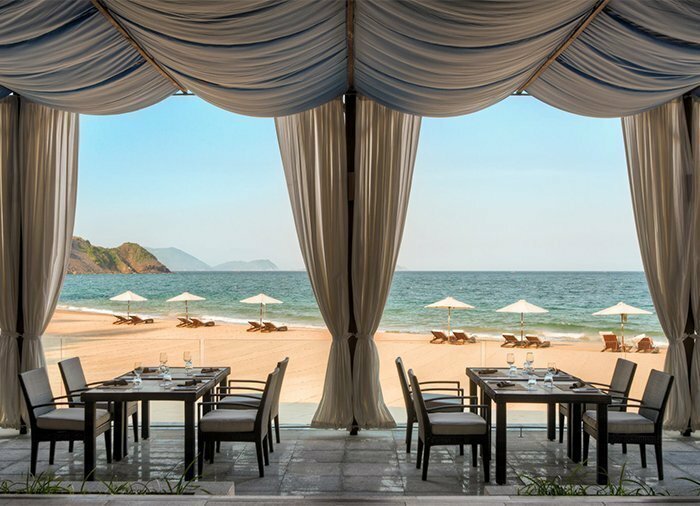 Facilities at the resort include a swimming pool, spa, children’s club, bar and ‘Sandals’ – one of the finest restaurants in Vietnam. 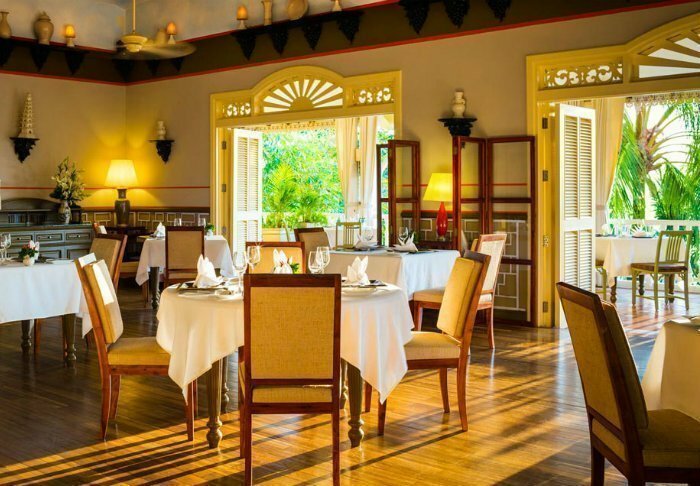 A dinner in Sandals is more than just a culinary treat; the presentation of the different courses and the atmosphere in the restaurant itself create a truly remarkable experience. 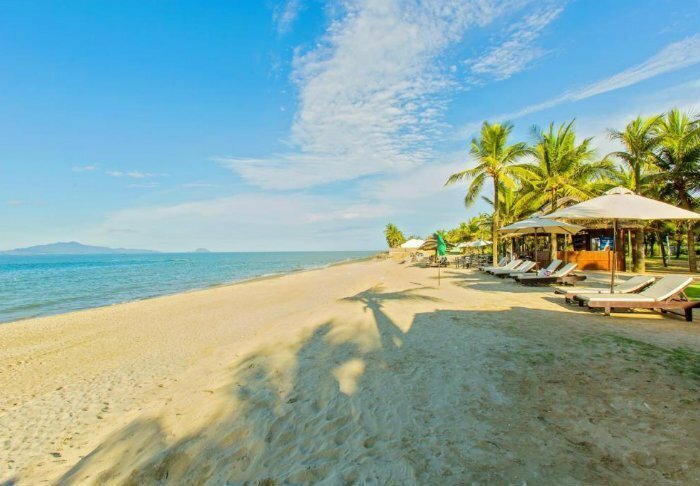 The resort organises all kinds of activities, such as yoga and meditation classes, a cooking school, diving and other water sports, and country walks in the immediate area. 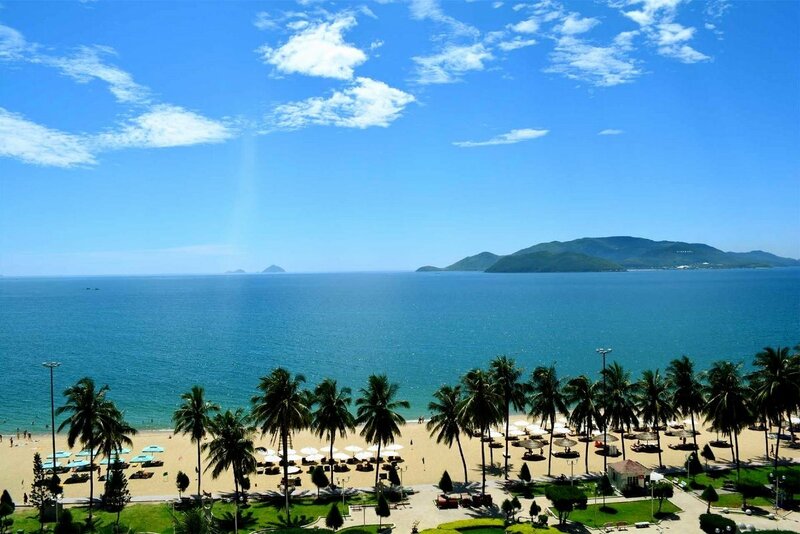 The hotel enjoys a central location in Nha Trang, close to a variety of shops and restaurants and right by the magnificent beach. 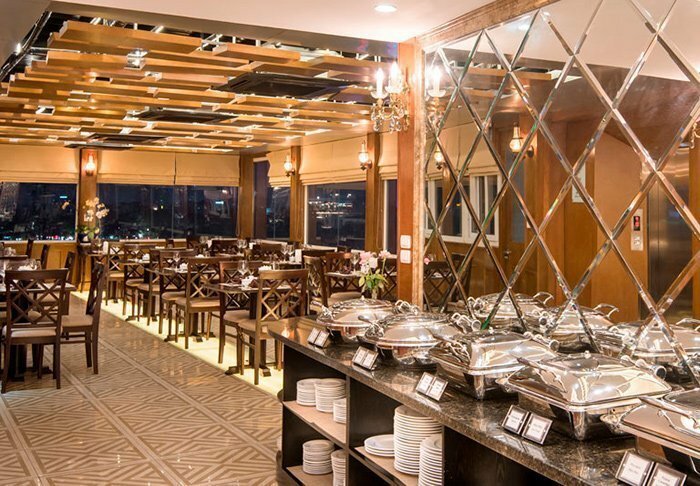 The 4-star hotel has 154 spacious rooms with conveniences such as satellite TV, telephone, WiFi, tea- and coffee-making facilities, a safe and a separate balcony. 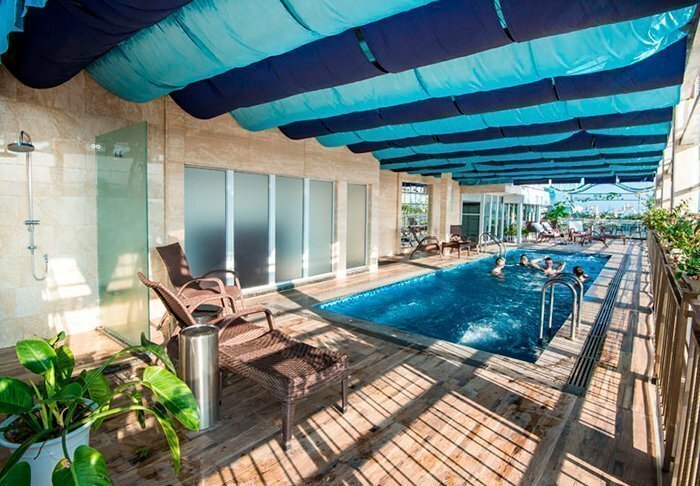 Facilities at the hotel include a swimming pool with pool bar, a fitness centre and a spa. 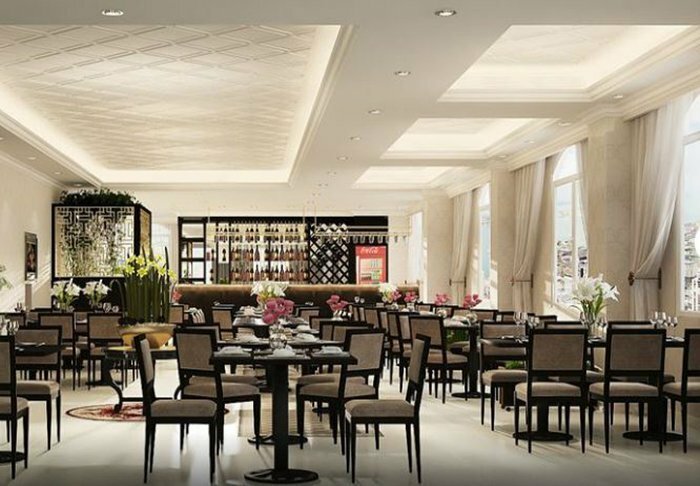 There is also every reason to visit the hotel restaurant, The Square, which serves delicious local specialities and international cuisine. 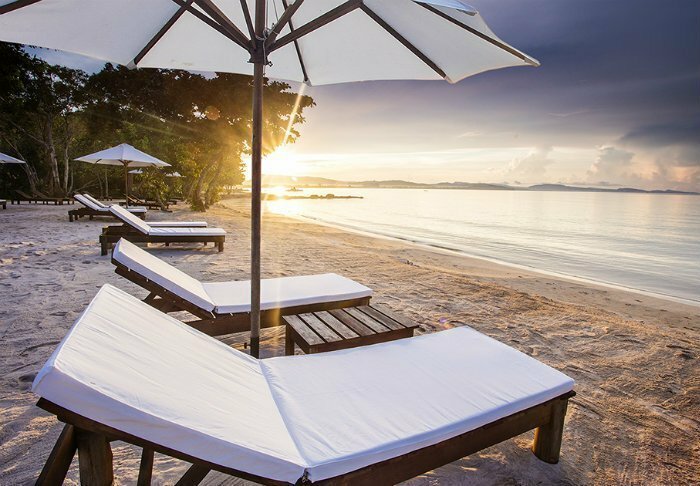 On the beach, there is a private area with sunbeds for hotel guests – perfect for lying back and relaxing between taking refreshing swims in the sea. 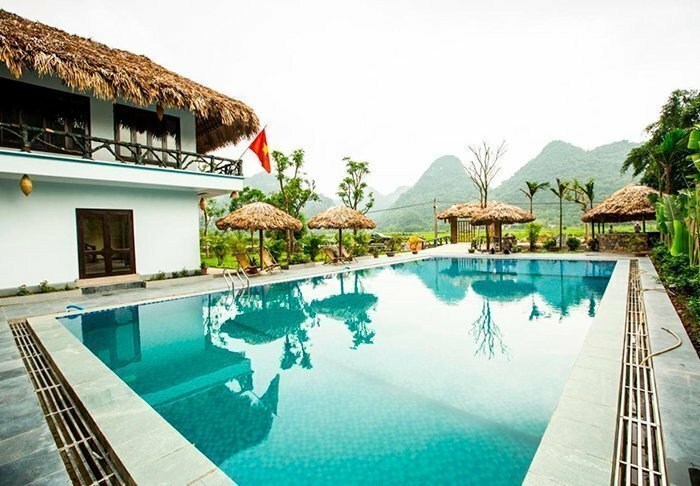 Situated in the scenic countryside south of Hanoi, nestled between the rice fields and limestone mountains, is the quiet and peaceful Tam Coc Rice Fields Resort. 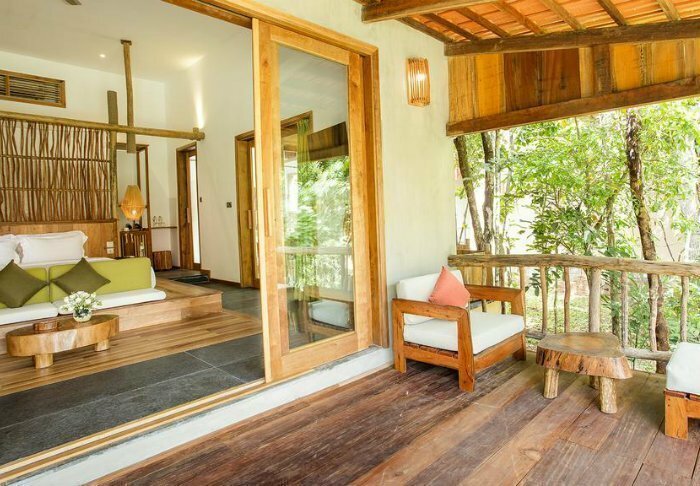 Relax in and around the tropical bamboo houses and enjoy the view of the rice fields, the beautiful garden and the wonderful mountains. 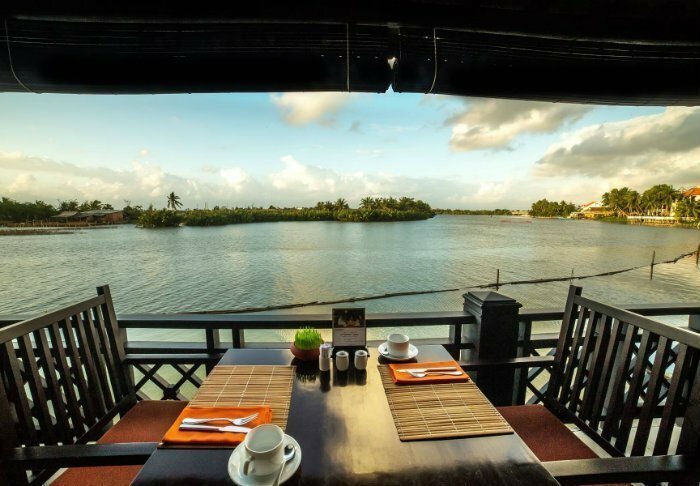 The same view can be enjoyed while you have breakfast on the balcony or in the resort’s outdoor restaurant. 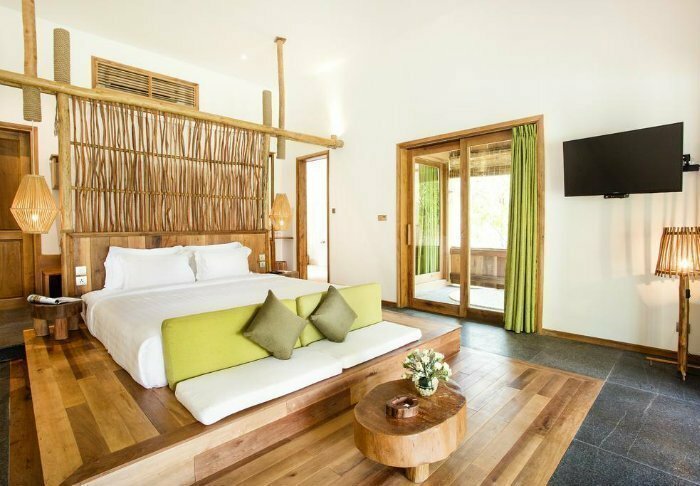 All of the resort’s 19 bungalows are divided into two luxurious, spacious rooms and have an en-suite bathroom and terrace overlooking the garden. 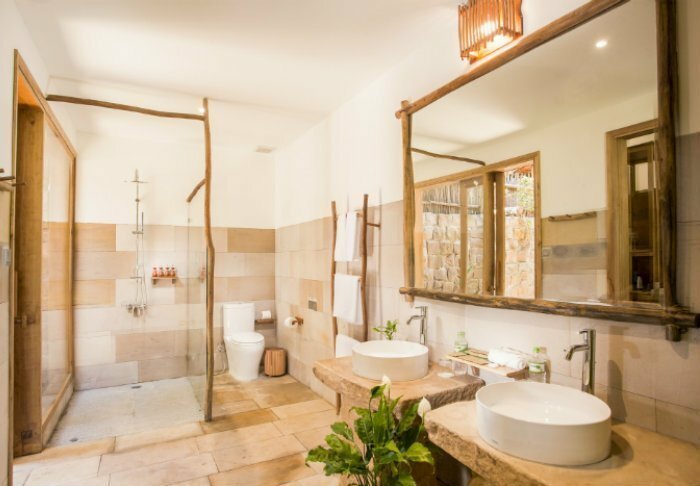 The rooms are tastefully decorated using local woods, stone, ceramic and tiles with traditional patterns, giving them a refined charm. 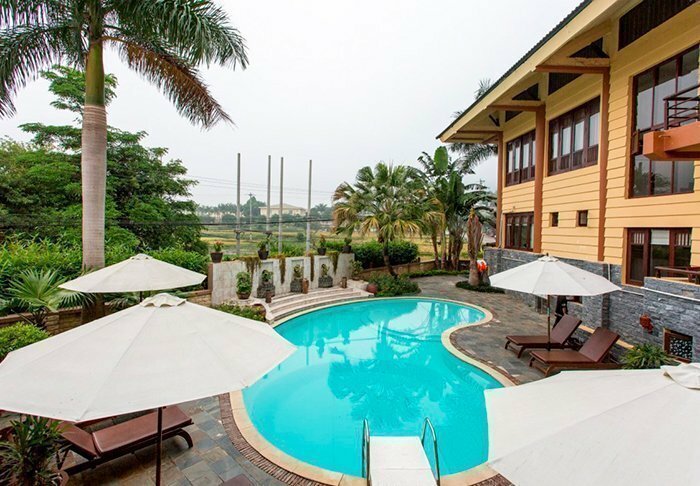 The resort also has a lovely swimming pool overlooking the countryside, and free Wi-Fi. If you wish to explore the scenic nature of the area, free bicycle rental is available in reception. 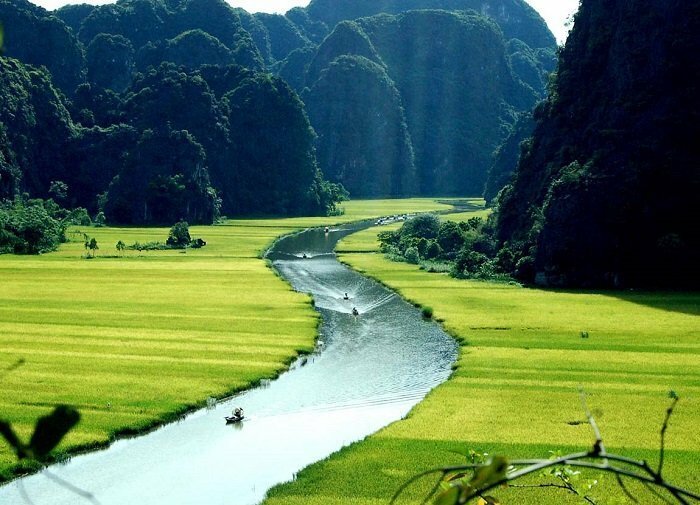 Long Hotel Ninh Binh is located in the heart of the city, which is the starting point for tours to the Tam Coc River. 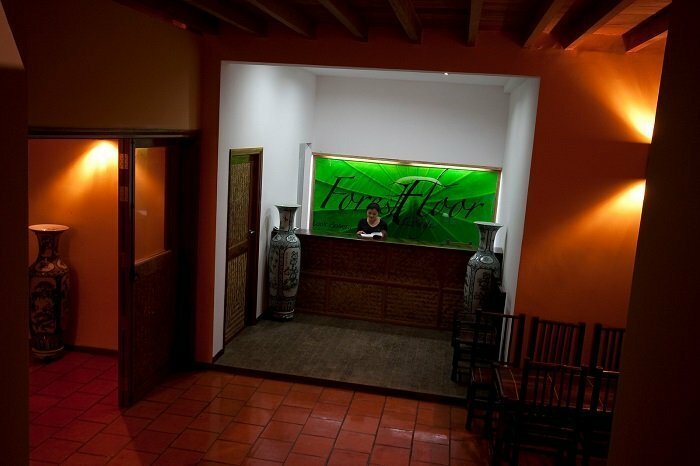 The hotel is very simple and furnished in traditional local style. 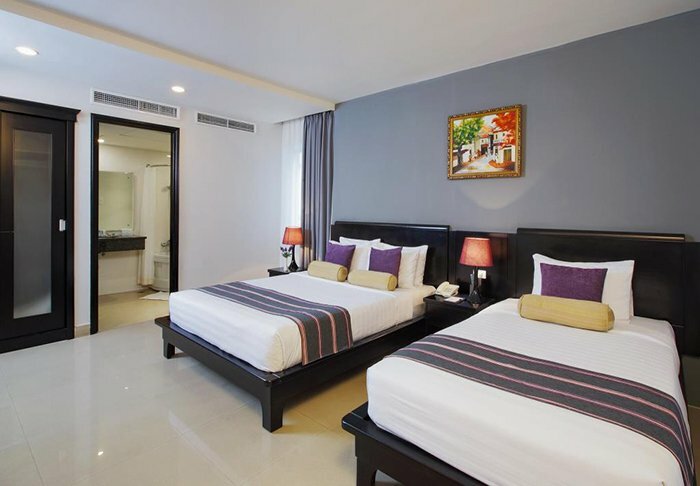 The rooms feature air conditioning and satellite/cable TV and have their own bathroom. 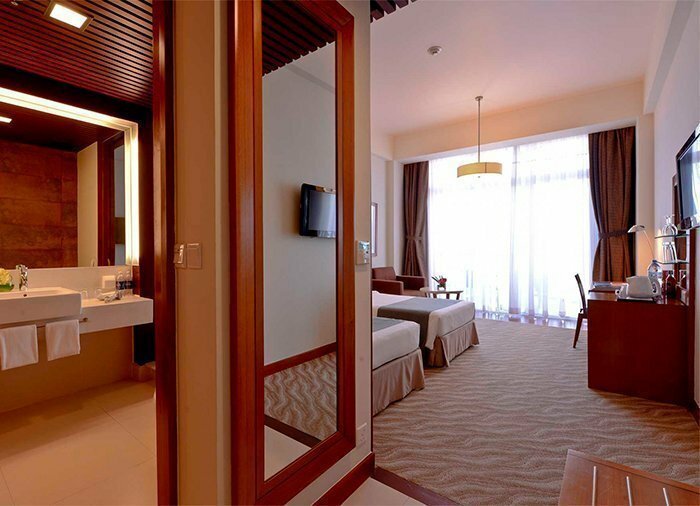 Other in-room conveniences include a minibar and facilities for making tea and coffee. 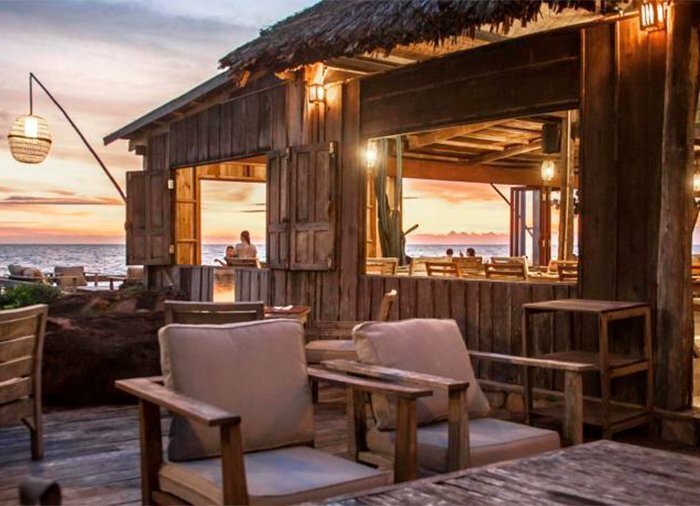 The hotel has a restaurant and a charming bar, which is the perfect place to enjoy a drink while the sun goes down and night settles over the land. 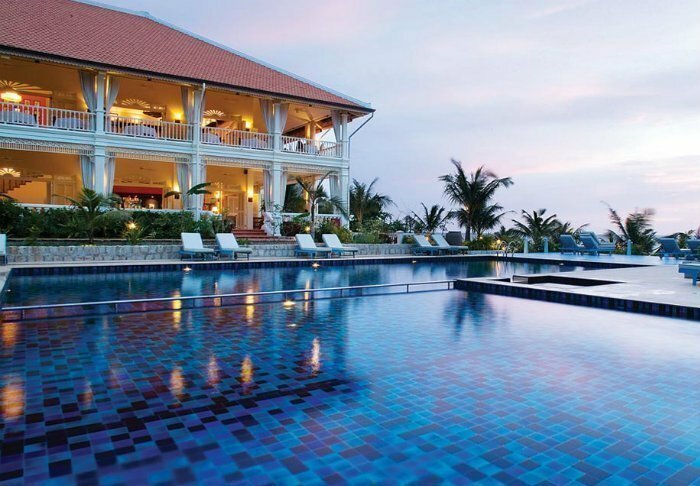 The 4-star Blue Ocean Resort is located in Mui Ne, approx. 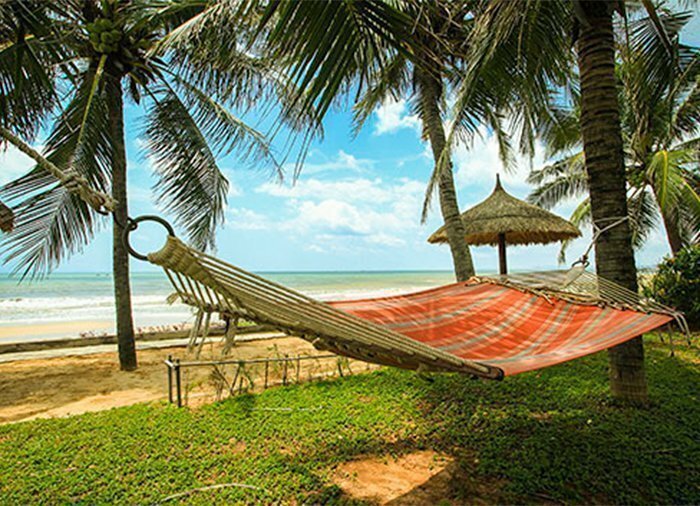 15 km from Phan Thiet and around four hours by car (approx. 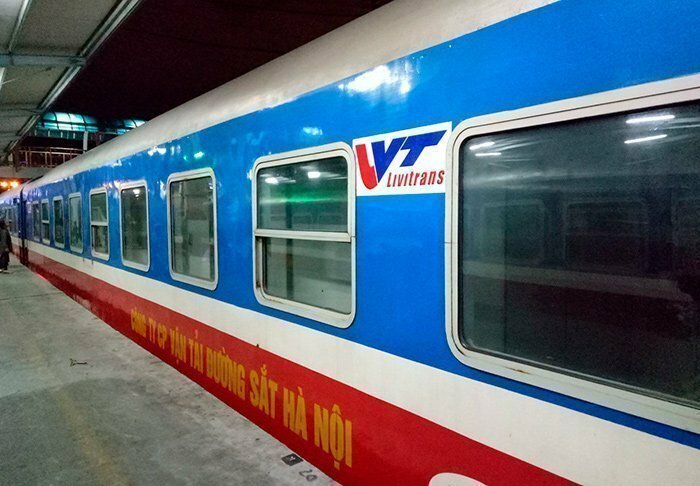 230 km) from Ho Chi Minh City. 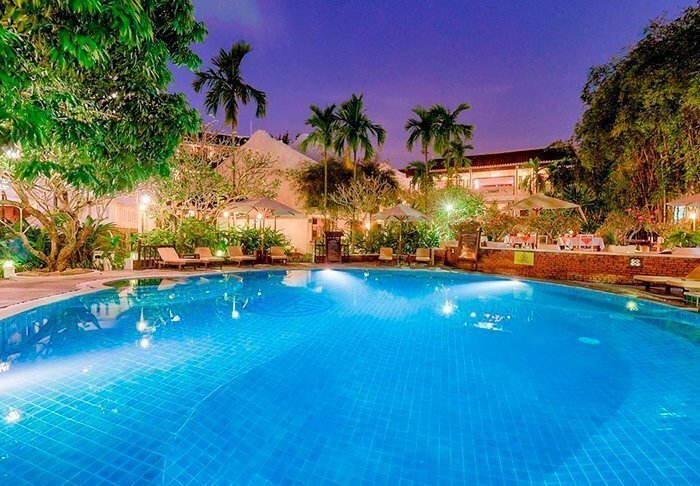 The hotel is set in a tropical garden, right next to the beach. 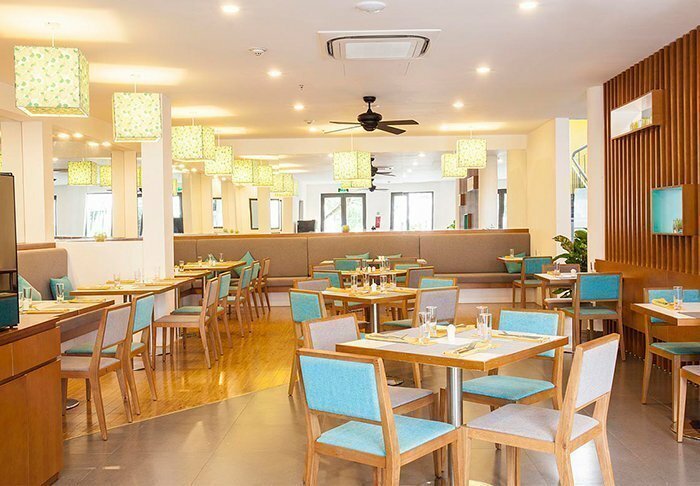 Facilities include a restaurant serving both European and Asian cuisine (and a special children’s menu), a lounge area where refreshments are served, a café, a swimming pool, and sun loungers on the beach. 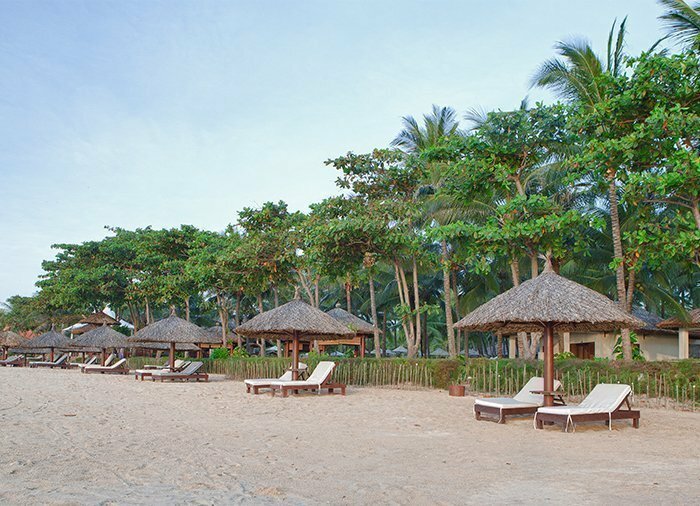 For an additional fee, you can enjoy spa treatments and activities including cycle rides and kite surfing. 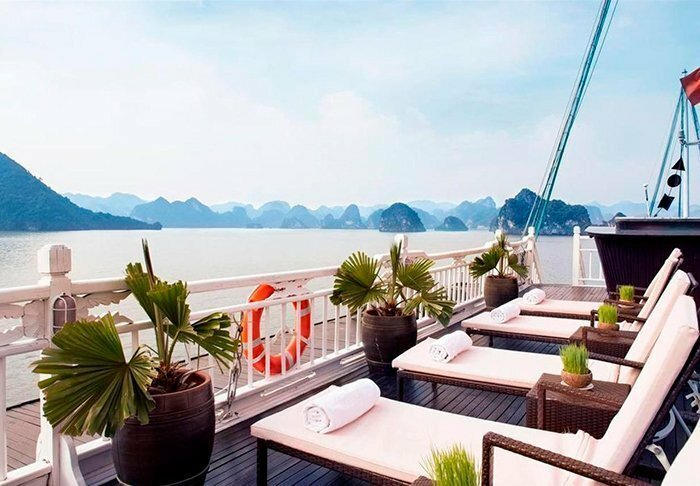 The hotel has around 80 rooms, all with a balcony or terrace. 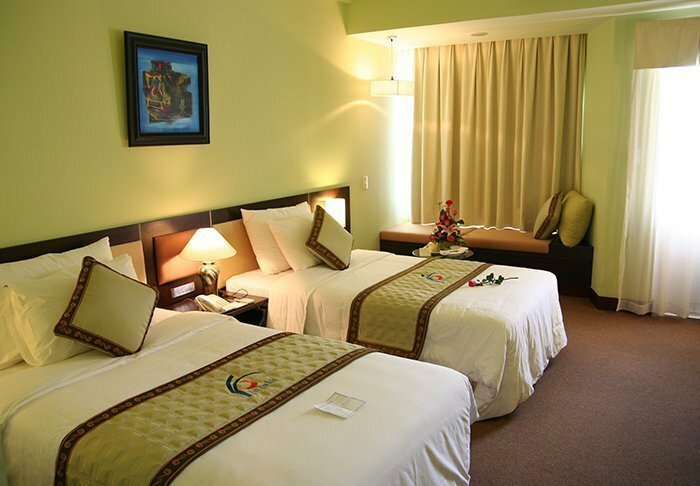 The rooms are furnished in modern style, with light, golden and ochre/orange colour schemes. 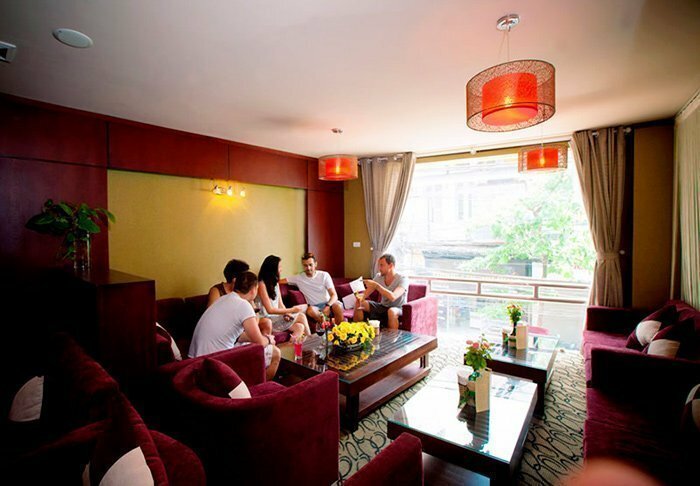 All rooms have free WiFi, air conditioning, cable TV, a safe and minibar, and facilities for making tea and coffee. 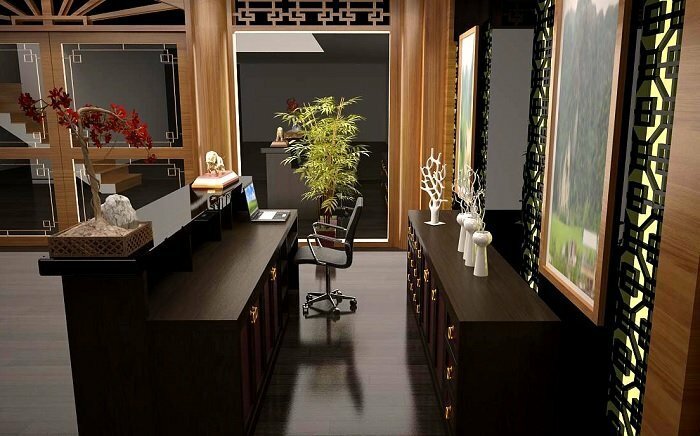 Accommodation in bungalows for an additional charge. 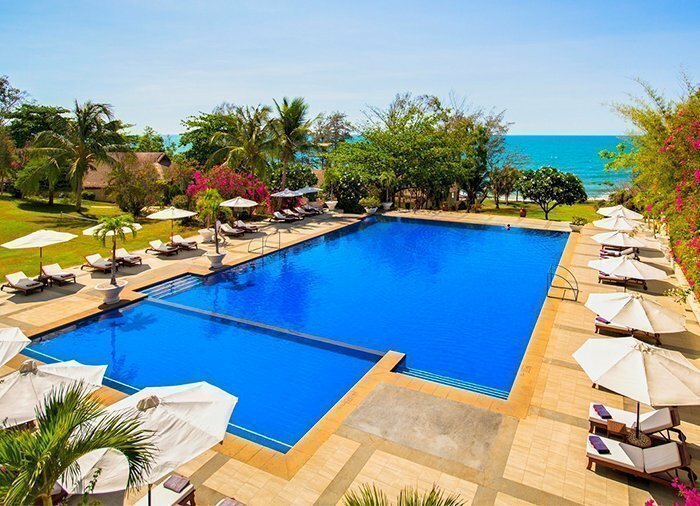 The 4-star Victoria Phan Thiet Beach Resort & Spa is set in peaceful surroundings right next to the gorgeous Mui Ne beach. 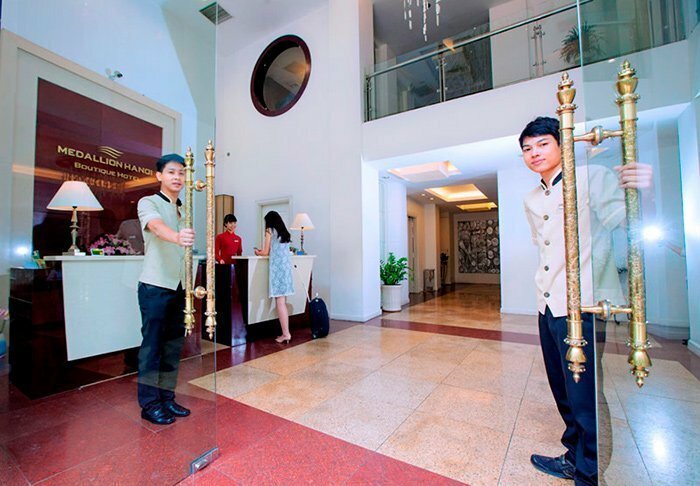 The resort focuses unswervingly on its guests, and you can be sure of extraordinary hospitality and service here. 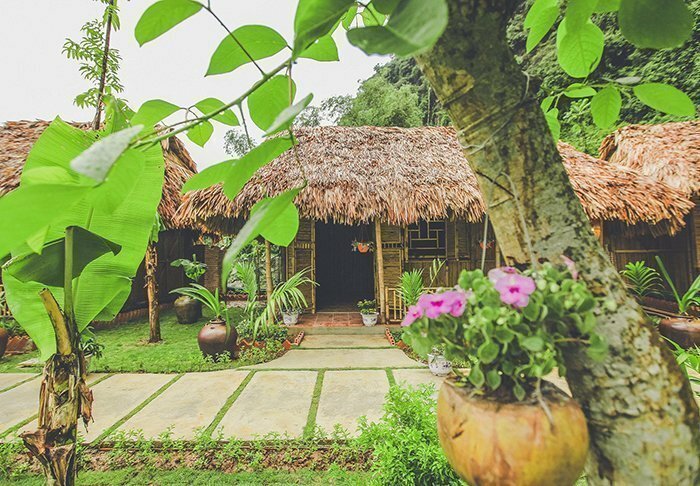 The resort’s thatched bungalows are surrounded by beautifully landscaped gardens, which blend harmoniously into the surroundings. 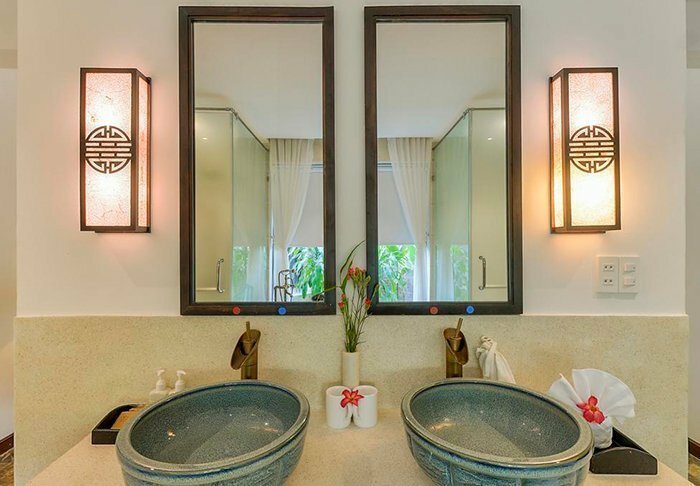 All of the bungalows are tastefully decorated in Vietnamese style inspired by traditional farm houses. 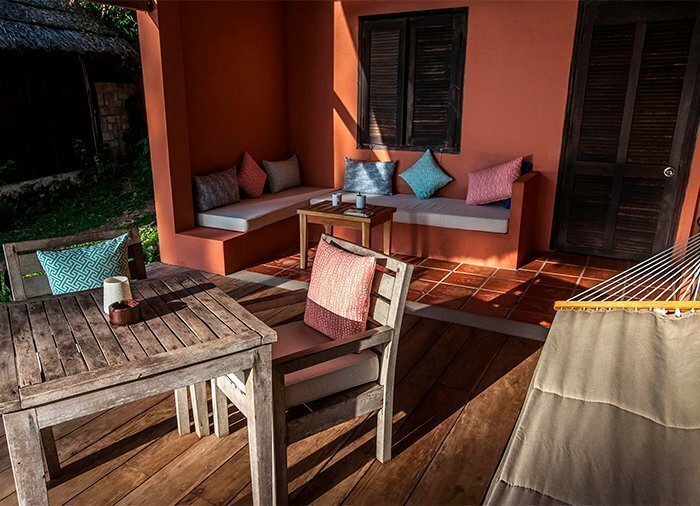 The rooms have their own terrace and are equipped with Wi-Fi, air conditioning, safe, mini bar, mosquito net, TV, telephone, coffee/tea making facilities, complimentary bottled water, hair dryer and bathroom with an outdoor shower. 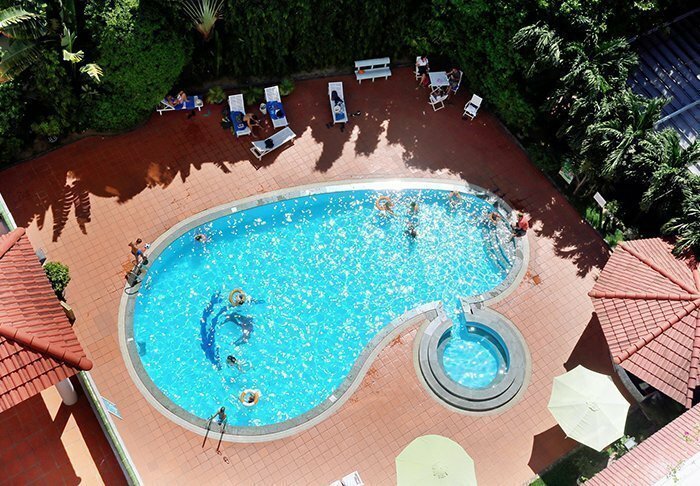 Facilities at the resort include two swimming pools, a spa, a fitness centre, a pétanque area, badminton, squash, tennis and volleyball courts, a children’s club, a bar and a charming restaurant that serves delicious local specialities and international dishes. 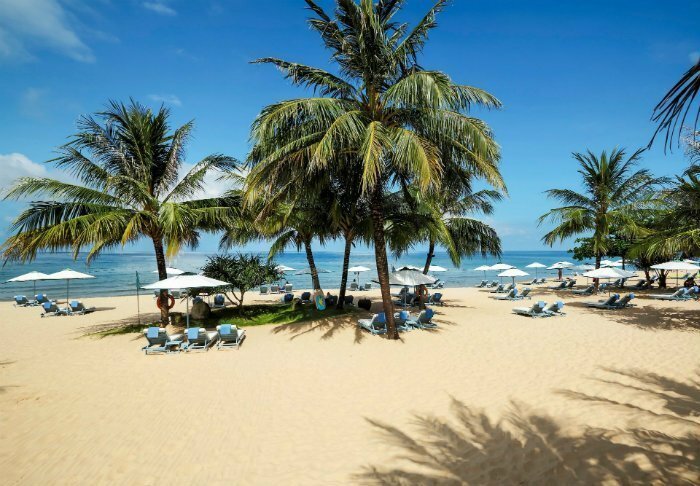 The resort organises tours to sights and attractions in the region, such as: the Mui Ne dunes, a guided tour of Phan Thiet, the Mui Ne fishing village, Lake Lotus and the reclining Buddha at Ta Cu – the longest Buddha figure in Vietnam, measuring fully 49 metres. You can also borrow bicycles free of charge from the resort and explore the local area at your own pace. After a day packed with experiences, relax and indulge yourself in the hotel spa department, that provides all kinds of massages and treatments, as well as reflexology (for a separate fee). 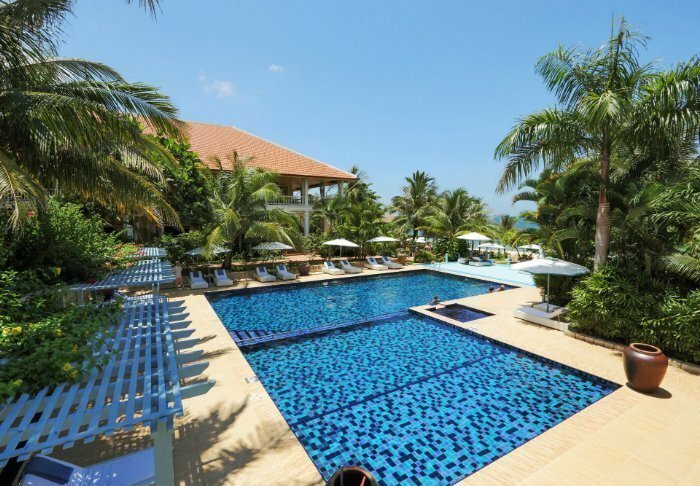 Green Bay Phu Quoc Resort & Spa sits on untouched grounds on the western side of Phu Quoc with a panoramic view of the Bay of Thailand. 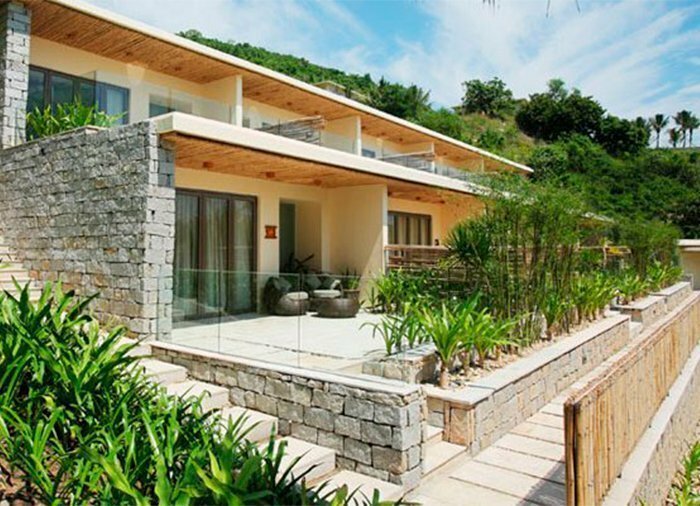 The resort is eco-friendly and is built from natural and sustainable materials that blend in perfectly with the natural beauty of the resort’s surroundings. That natural, rustic design can be found in the big, spacious rooms as well. 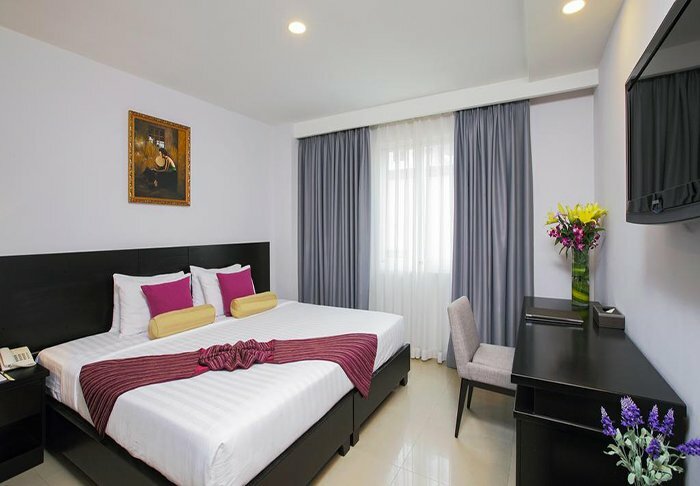 All the rooms feature Wi-Fi, air conditioning, a ceiling fan, mini-bar, safe and a big, lovely bathroom with a hair dryer, bath robes as well as a shower and bath tub. From the terrace, you can enjoy the calm and the green surroundings. 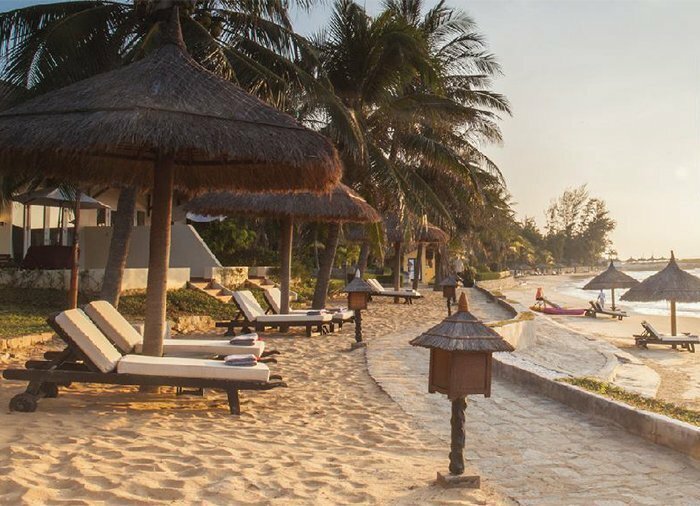 Green Bay has both an infinity pool and a private sandy beach with beach chairs, from which you can also enjoy the gleaming red sunset. After a beautiful day in the sun, you can treat yourself to a relaxing treatment in the spa department, which is divided into small pavilions with partitions. The resort has two restaurants. 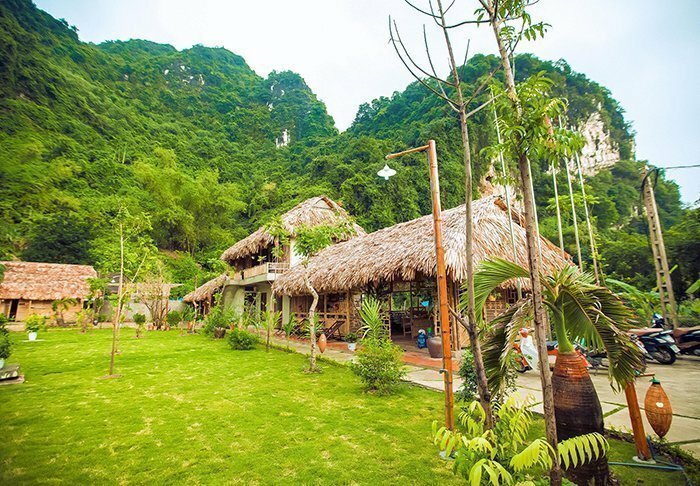 The main restaurant, Green Bay Restaurant, is an outdoor restaurant that serves dishes from both the East and the West, as well as delicious fish and shellfish dishes. 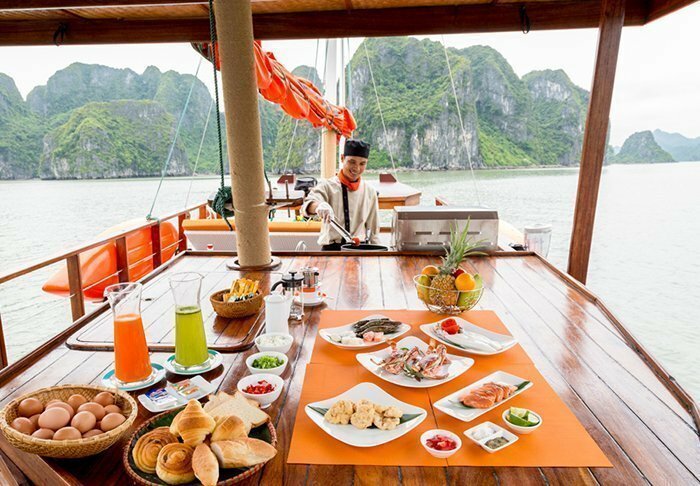 Dream Bay Restaurant sits by the water’s edge and offers snacks and small, healthy dishes made with local ingredients. 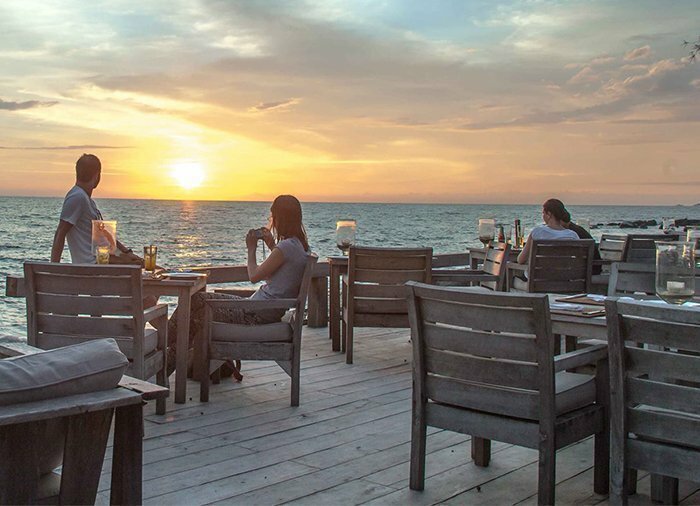 Here you can also enjoy the sunset with a “sundowner” drink on the veranda. What both restaurants have in common is that they use organic ingredients, including herbs and vegetables from their own gardens. The other facilities at the resort include a fitness room. 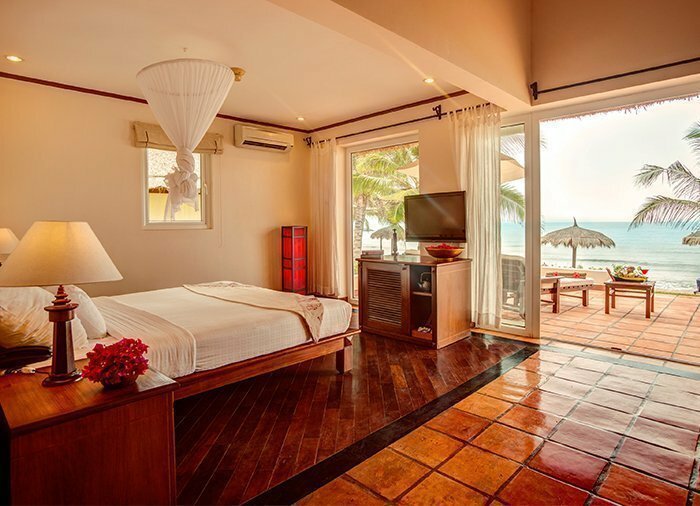 La Veranda Resort sits on the Long Beach on western Phu Quoc. 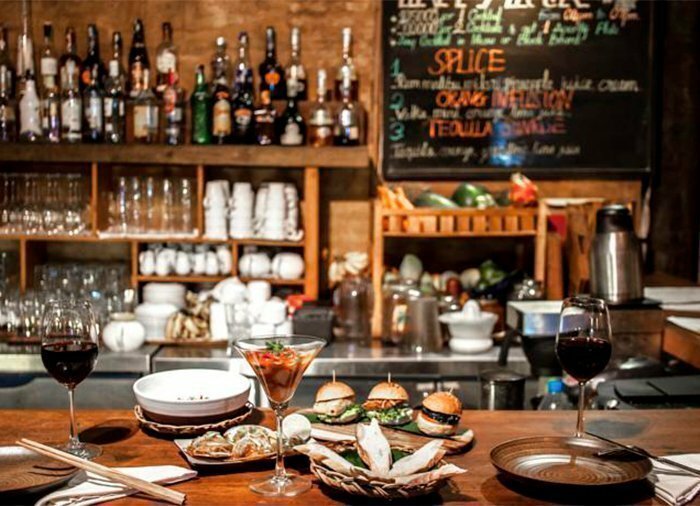 Nearby, you can find restaurants and beach bars. The night market in Doung Dong is 10 minutes away by taxi. 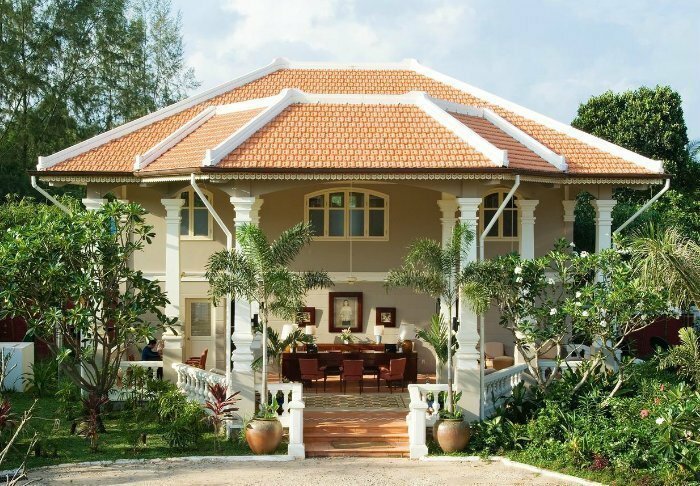 The resort is constructed in an elegant French colonial style and is surrounded by tropical gardens. 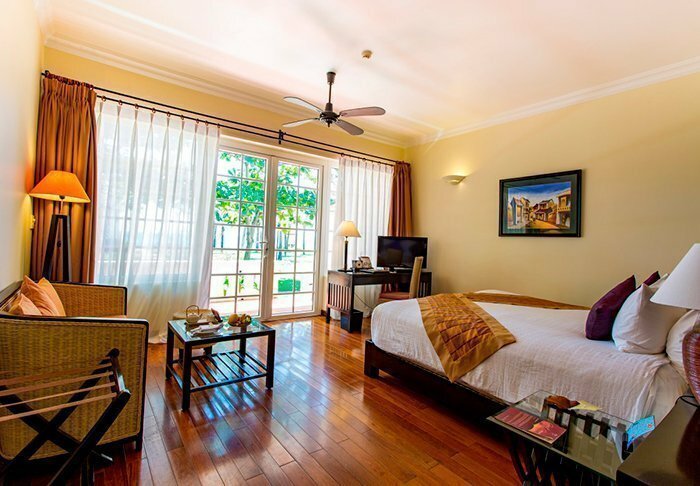 This elegant French style can also be found in its 70 tastefully-decorated rooms, all of which feature Wi-Fi, air conditioning, a safe, TV, refrigerator, mini-bar, tea and coffee facilities as well as a bathroom. From your balcony, you have a view of its beautiful gardens. 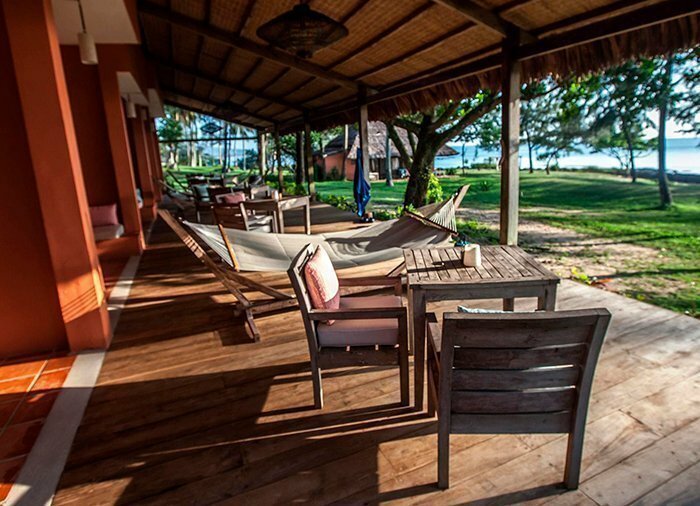 La Veranda has a private beach including loungers, where you can laze about and enjoy the view of the sea. 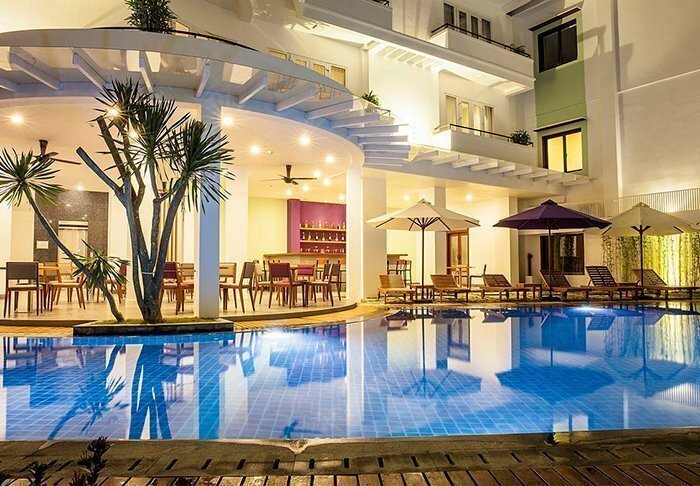 There is also a wonderful pool area for children and adults. The resort has two eateries. 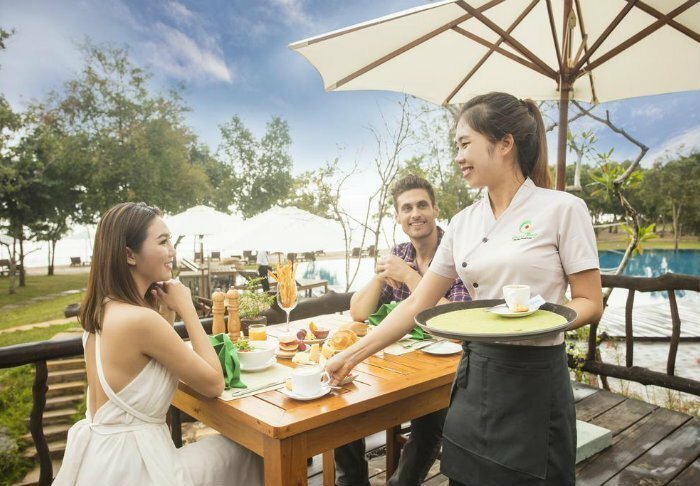 Aside from the main restaurant, The Pepper Tree, there is also the restaurant Le Jardin, which is an outdoor restaurant with an impeccable view of the sea. 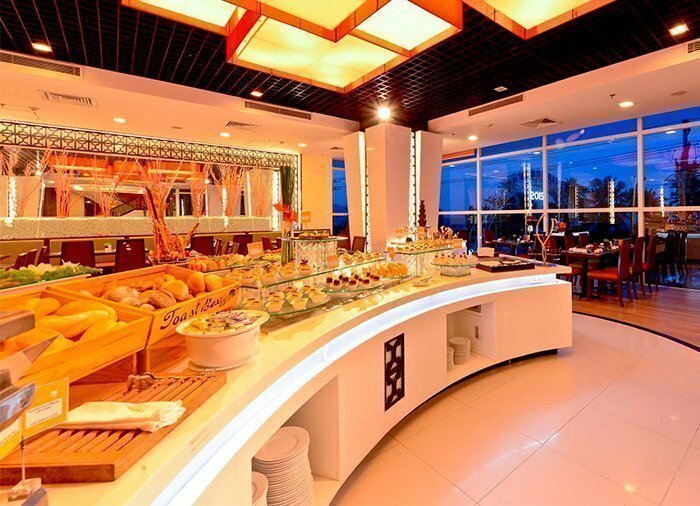 Here you can enjoy your breakfast, an afternoon snack or a drink to the enchanting sunset. 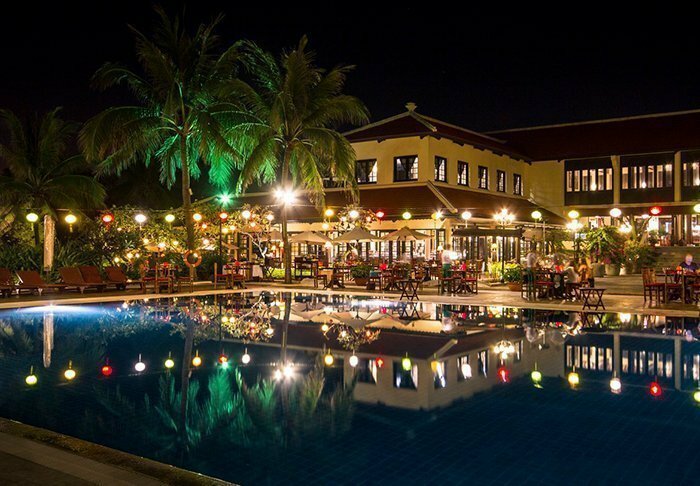 After sunset, the lounge bar opens, and many colourful drinks are available for purchase. If you should need to spoil yourself a little, you can book time in the spa for a relaxing treatment. 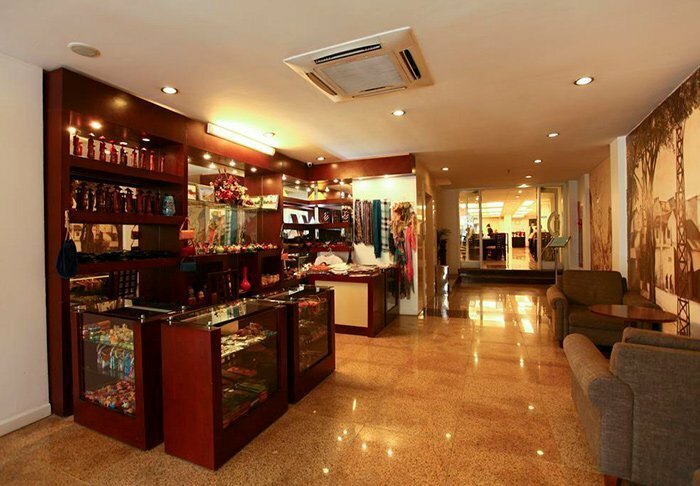 Other facilities include a fitness room, a children’s club and a souvenir shop. 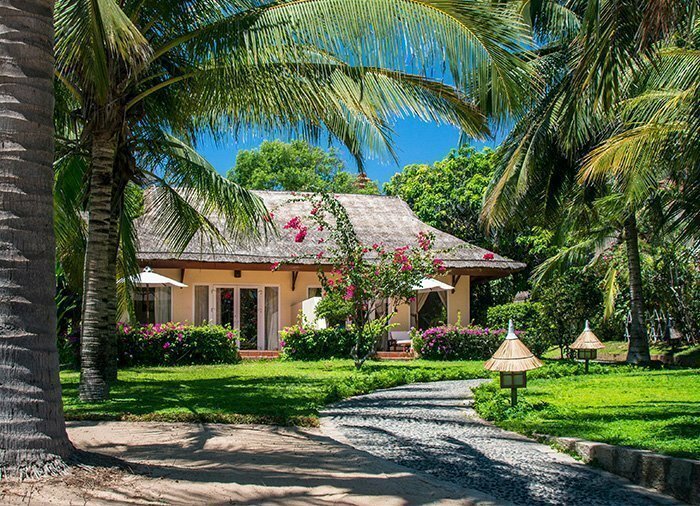 Mango Bay, a 3-star, eco-friendly resort, is set in an extensive area of land with plenty of plants and flowers, right next to Ong Lang beach on Phu Quoc. 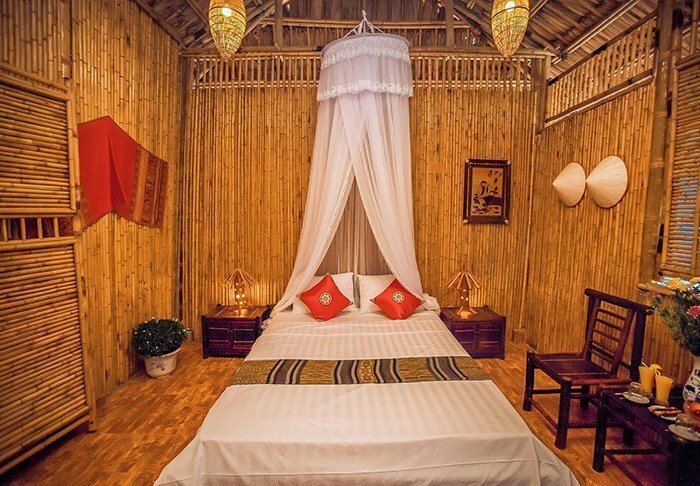 The resort has 44 rooms, all individually furnished in rustic style. The bathrooms are outdoors. 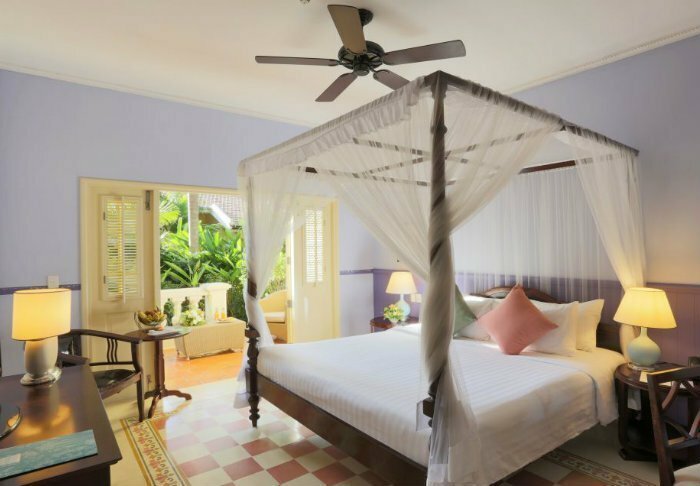 The rooms are equipped with a ceiling fan, mosquito net and safe. Other conveniences include tea- and coffee-making facilities and free Wifi. 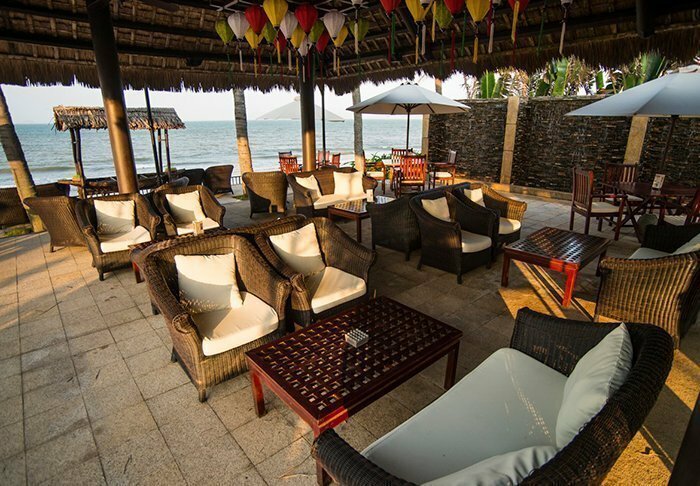 The resort has a beach bar and two restaurants so you can choose to enjoy dinner indoors or outside on the terrace, admiring the wonderful view out over the water. 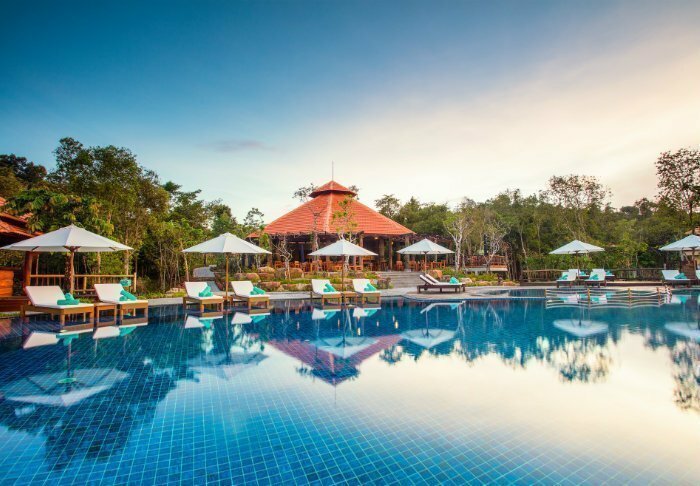 The resort organises a wide range of activities: snorkelling, paddle boarding, kayaking, yoga and tai chi, to name but a few. You can also borrow bicycles free of charge and explore the island at your own pace.